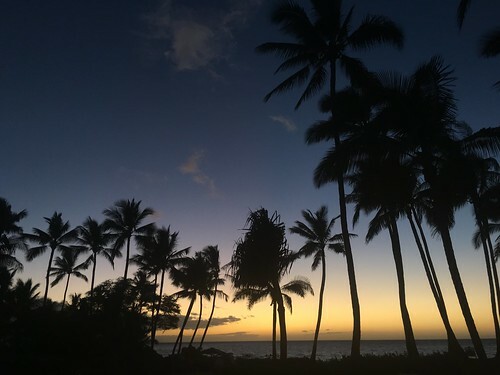 LTHForum.com - Anyone been to Maui Lately? Anyone been to Maui Lately? LTH Home > Chat > Beyond Chicagoland > Anyone been to Maui Lately? This was great Steve. We were married in Makena. I sent this post to Mr. pairs4life you captured some magic! Thanks for reporting back! Glad you made it to some of my favorites. After a lunch at the Katy's Westmont location today, I made it over to Standard Market where they do sell at least three varieties of Adoboloco Hot Sauce, in case anyone is interested in checking out a bottle or two. They didn't have the Ghost Pepper variety shown in my picture, but I picked up a bottle of "Bangkok", which I'll bring to the LTH Picnic on Sunday, if anyone is interested in trying it out. Back from another epic trip on Maui! 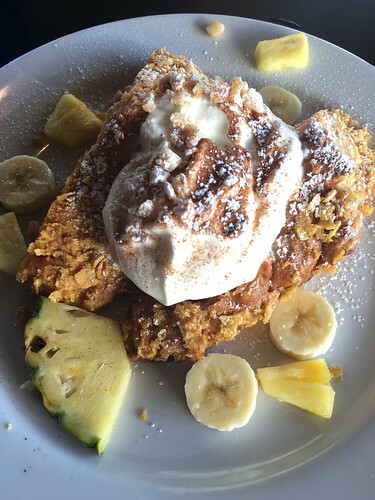 Kihei Caffe, Kihei: Went for breakfast nearly every day. My husband is a creature of habit and stuck to the surfer sandwich (on ciabatta with eggs, bacon, avocado, and tomato), while I tried a variety of items. I had one of my favorites, huevos rancheros, one morning. One special that I tried was the Marlin Benedict was good but as good as other fish benedicts I've had in Hawaii. Some days I kept it simple with eggs, Portuguese sausage, and fried rice (yum). Or a biscuit with a jar of lilikoi or guava butter on the side. Our favorite place for breakfast, and good to see they've expanded the seating options by adding a counter outside. They open very early and the food comes out fast, which is always good for a starving and jet lagged person like me! Unfortunately, not sure if they are still doing their cinnamon roll French toast. Nalu's, Kihei: One of the few places open on Christmas Day. 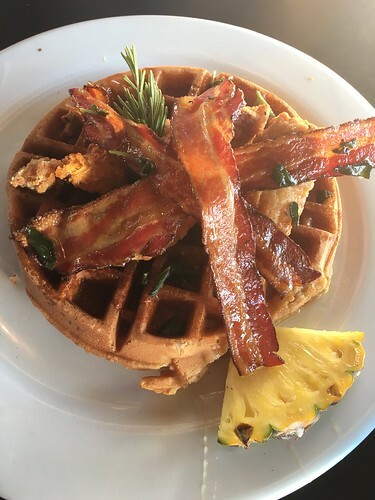 I enjoyed cornflake French toast stuffed with a lilikoi marmalade custard, topped with pineapple, banana, and macadamia nuts while the husband had a very hearty fried chicken & waffles dish topped with bacon and bits of fried sage and a big stick of rosemary. Interesting and creative menu, with a lot of gourmet touches. I also liked the pineapple "spa water." The grab and go fridge also looked like it had some nice snacks and desserts. I just wish they opened earlier than 8am as we’re usually up at 6am due to jetlag. 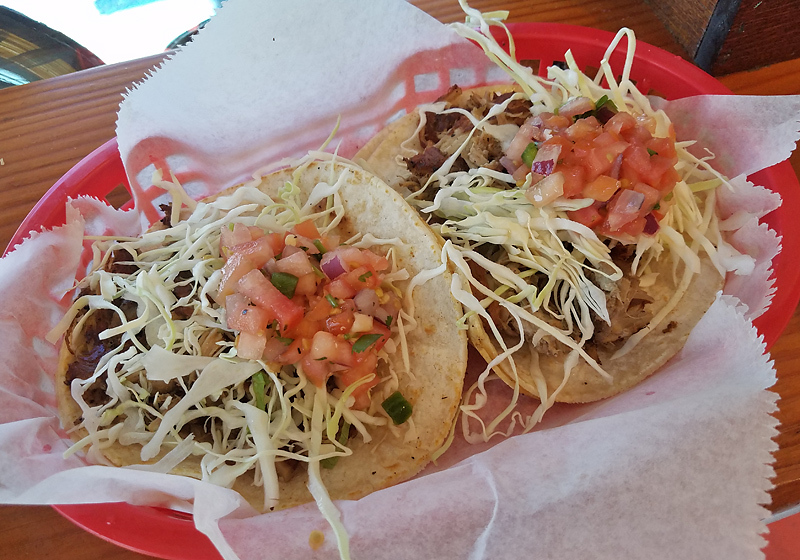 808 Grindz, Lahaina: Cute little spot, and super cheap! 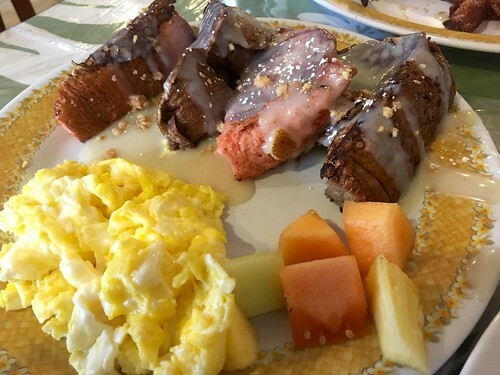 This time I had the rainbow french toast (taro bread, guava bread) with fresh fruit and scrambled eggs, a side of Portuguese sausage, and the house mac-nilla sauce, which was amazing. Husband tried the crispy kalua pork patties with scrambled eggs and fried rice. Also super tasty. Service was exceedingly friendly. Wait was fairly short, luckily, as it’s a tiny, tiny place. 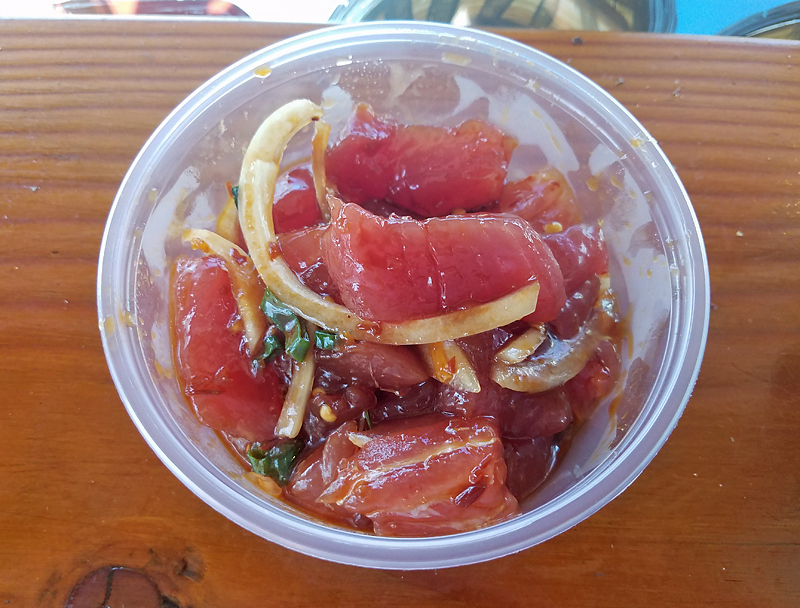 Eskimo Candy, Kihei: Our usual favorite for poke bowls for lunch. The wasabi aioli on the white rice really makes it, and I love the variety of shoyu, wasabi, spicy, and furikake, plus seaweed salad and a slice of kimchee cucumber. We went back several times for lunch. Note: if you want fish to cook with, it's best to call ahead and pre-order. The line to get fresh fish seems rather long at times. 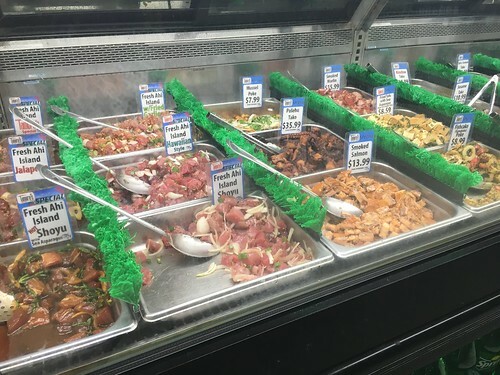 Tamura’s, Kahului: This time we got a 1/2 lb each of the spicy, ninja (furikake with eel sauce I think), ahi with fried garlic, and hamachi pokes. The fried garlic was a surprise hit. Though very garlicky. Solid choices here, and lots of variety. I grabbed some seaweed salad and taro chips as well to complete our takeout meal. And they were open on Xmas! Can't wait for the Kihei one to open. Foodland Farms, Lahaina: This is an upscale grocery store that is related to the other Foodlands on Maui, but this is the ONLY one branded as Foodland Farms. The poke here didn’t seem to be as quite good as it used to be last year, but it might be because we got there late-ish in the day. Still good though. We had furikake, shoyu, sweet chili, and spicy poke, as takeout, instead of bowls, though most people were ordering bowls. The texture seemed a bit gluey. Perhaps it had been sitting for too long. Poke at Merriman’s & Monkeypod Kitchen: See below. Ululani’s Shave Ice, Various Locations: We went three times this trip. I supplemented our usual lilikoi, guava, and pina colada combo with a snow cap and... toasted coconut flakes on top for the first time! Plus our usual macadamia nut ice cream on the bottom. Delicious! The toasted coconut flakes provide a nice contrast to textures of the other elements. Best shave ice! Donut Dynamite at the Swap Meet, Kahului: Madame Donut and her husband had a great variety of donuts at the Swap Meet but we stuck to our favorite, her lilikoi cream filled malasadas. Her husband always fills them with a generous hand so they "explode" when you bite into them! Thumbs up. So, so good. Even better than Leonard’s on Oahu (where they skimped on the filling for 2 of our malasadas a few days later). Donut Dynamite at the Maalaea General Store: We also picked up some of her coconut cream filled malasadas at the Maalaea General Store on another day. Fantastic as always. They sell out fast here! 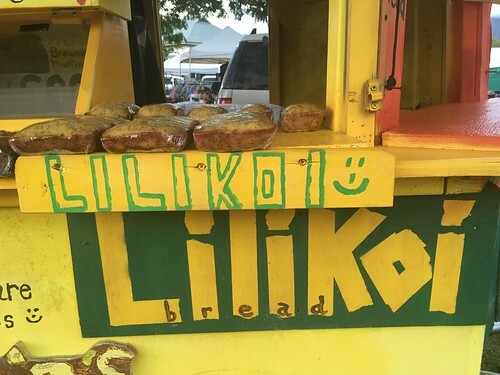 Aunty Lia’s lilikoi bread at the Swap Meet, Kahului: Wonderful taste. More like a flat cake than bread? Don’t be fooled by the shape! Crunchy, finely ground passion fruit seeds scattered throughout though. But a great sweet and tart taste. Mmmm. Fruit at the Swap Meet, Kahului: We also picked up some great apple bananas on sale for $0.99/lb! 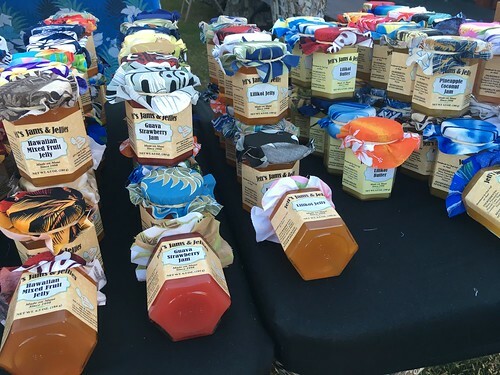 Jeff's Jams and Jellies, Swap Meet: Picked up some lilikoi butter for home. Score! 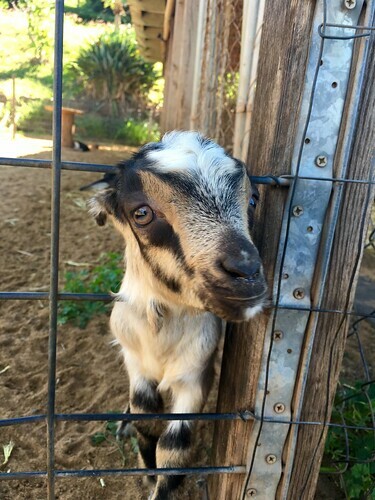 Surfing Goat Dairy, Kula: After petting some adorable baby goats, we shared their fabulous strawberry quark ice cream and some goat milk truffles. Yum! I tried some lilikoi quark and it wasn’t for me. But the truffles were great. 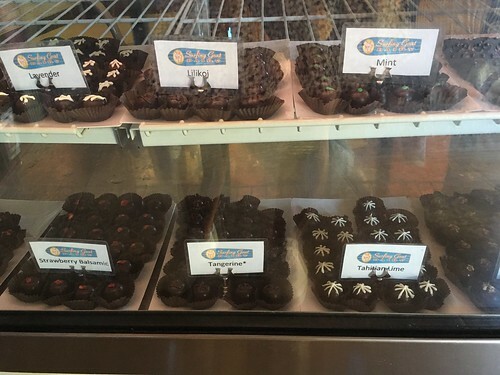 They had lilikoi truffles, Tahitian lime, salted caramel, chile pepper, and many more flavors. 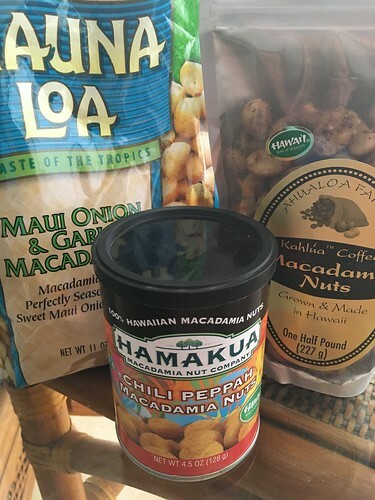 Macadamia nuts, from Foodland or ABC Stores: My new favorite flavor is Chili Peppah by the Hamakua Macadamia Nut Company. But Maui onion and garlic is still great, too, as is Kona coffee glazed. And of course the usual Island Princess Mele Macs (my favorite), and Maui Kookwees (white chocolate macadamia nut, my husband’s fave, whereas I like the Kona coffee macadamia nut). 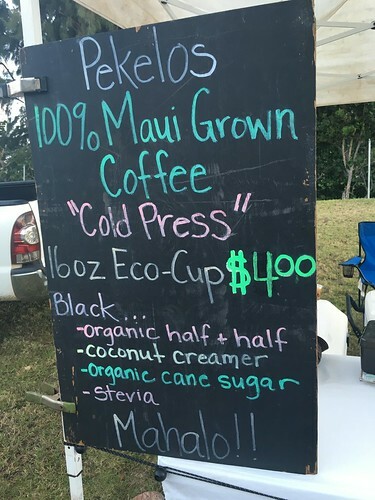 Wai Lemi at the Swap Meet, Kahului: I really enjoyed trying their cold pressed iced coffee from Pekelos at the Swap Meet though it might have been a bit too strong for me. Chatted with the Pekelos proprietor several stalls down and walked off with a bag of their “medium" blend, Maui Sunrise. 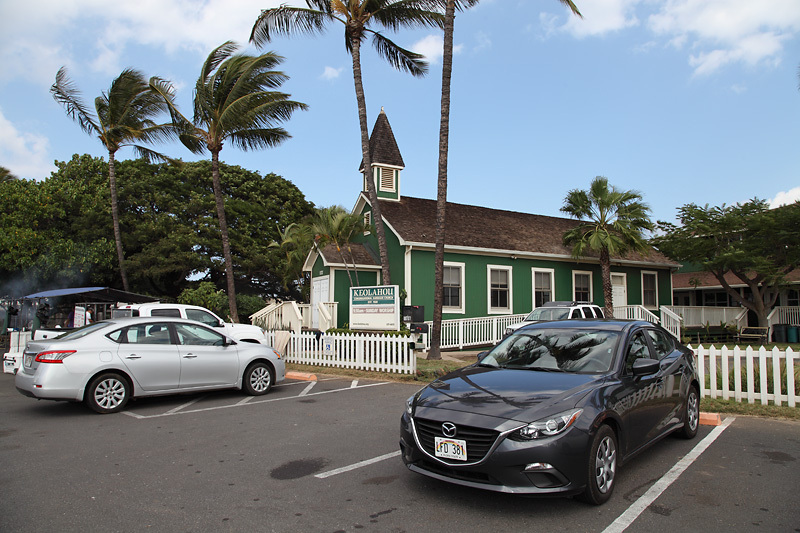 MauiGrown Coffee, Lahaina: Another great place to grab a cup of coffee on Maui. Also had fun trying the different varieties of Maui grown coffee here. 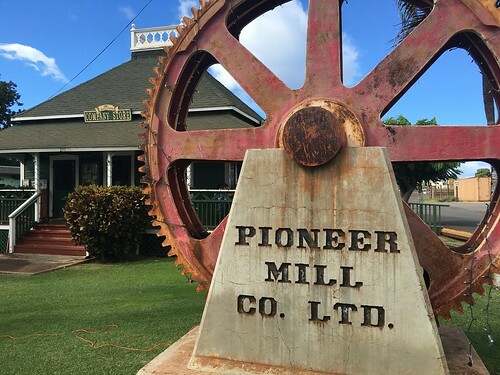 So easy to find, just look for the smoke stack in Lahaina! Belle Surf Cafe, Kihei: Formerly known as Memphis Belle. Now under new management. A fun place to hang out and chill in the courtyard. I had a delicious iced coffee drink with a shot of espresso and a healthy shot of coconut milk as well. Yum! 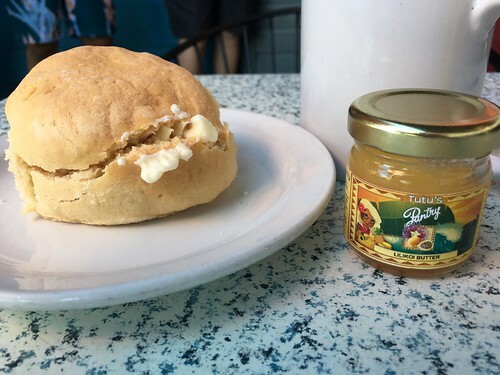 Grandma’s Coffee House, Kula: We were too stuffed to try one of their enormous cookies or pastries, but a hot cup of coffee hit the spot, and my husband played with their cat on the patio. We are also now totally addicted to 100% Maui grown Red Cataui coffee. Dark, complex, so good. I picked up a bag at Foodland and we went through the whole thing fairly quickly. Lehua Lounge, Wailea: We enjoyed some cocktails at the Lehua Lounge after dinner at Morimoto. 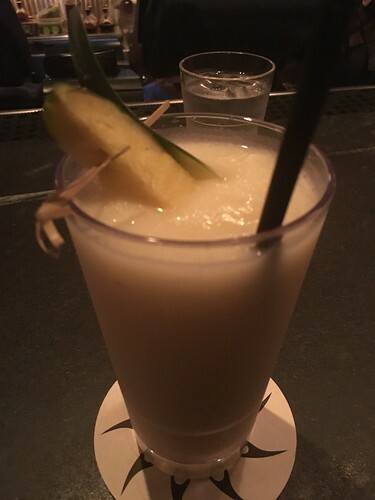 Thumbs up to the great and friendly bartenders there and their pina colada, as well as the 1944 Mai Tai. 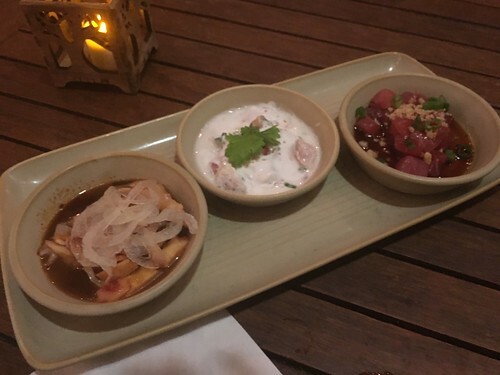 We also had excellent drinks at our meals at both Merriman’s and Monkeypod Kitchen, decent ones at the Feast at Lele, and bad ones at Migrant (see below). Coconuts Fish Cafe, Kihei: Very very crowded over the holidays and they were closing early for Christmas Eve so were only doing takeout if you arrived after 6:30pm. Our coconut shrimp was very good as usual (lots of real coconut) and fish tacos seemed to hold out OK as takeout. We ate on the lanai and relaxed. 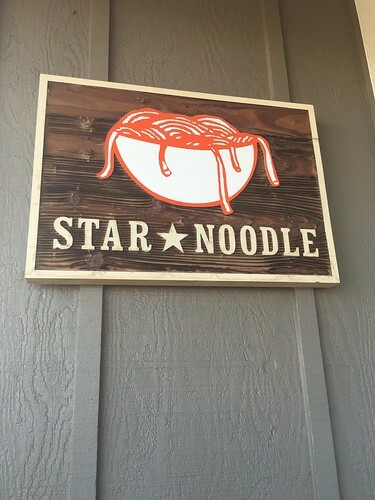 Star Noodle, Lahaina: The place was hopping for Saturday lunch and I was glad we had reservations. The line seemed fairly long; even witnessed someone trying to make their next reservation on their way out the door. Food was pretty good. Our sauteed Alii and shiitake mushrooms were good but needed a bit of soy sauce. I liked but didn't love their pork buns (the bao quality is better at Momofuku in NYC). However we both really enjoyed their marinated kalbi steak and Filipino "bacon and eggs," which arrived fragrant and sizzling, with big chunks of bacon, scallions, and onions, and the rich aroma filling the room. Thumbs up, in stark contrast to our bad meal at Migrant a few days later. Shark Pit Social, Lahaina: Great place! Seemed a bit quiet but we were there fairly early for dinner. 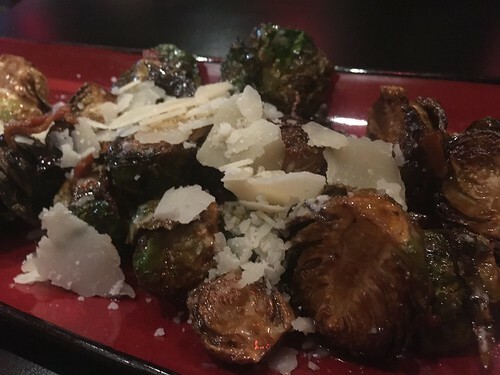 We adored their bacon, Parmesan, and eel sauce Brussels sprouts. Creative & tasty! Next was a steak taco plate, and a kimchee shrimp taco, with sides of fried rice. Both taco plates were quite good, which the steak being slightly better than the shrimp. The tortillas looked house made and were toasted on a griddle before serving, a touch I really appreciate, but I did find them slightly thick for the taco filling (and I'm a bit picky about tortillas because I've had a bunch made fresh by a chef friend from Texas). I'd definitely go back here though, to try out other dishes. 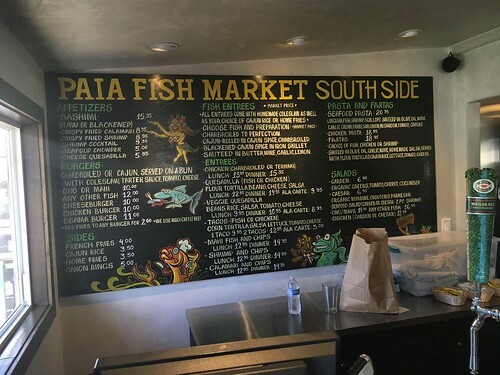 Paia Fish Market, Kihei: Glad to have this in the “neighborhood." 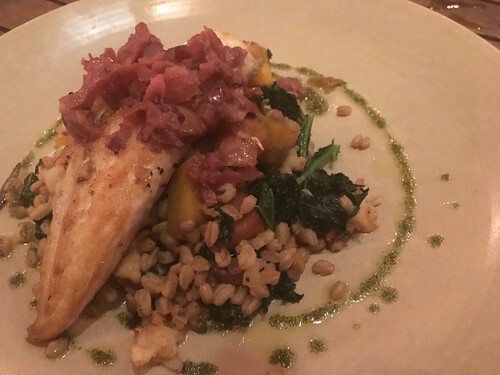 Yes, the fish here is awesome and incredibly fresh, and it's so great to have them in Kihei. I adored my seared ahi burger and their seasoned shoestring fries. Nobody seems to talk about how good their fries are! Impossible to stop eating. We stuffed ourselves silly here. So good! Will definitely be back. Ulupalakua Ranch Store, Kula: Ordered two awesome burgers here for lunch. Juicy, flavorful, and meaty. 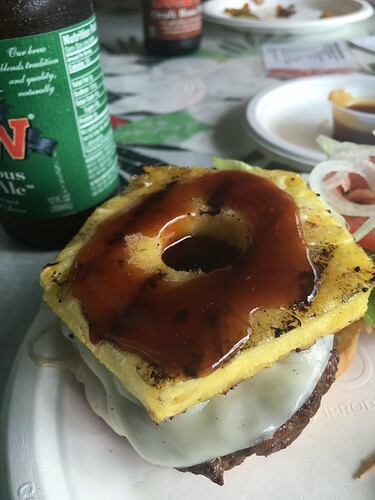 We did one elk burger, with teriyaki sauce and grilled pineapple, as well as one deer burger with sautéed mushrooms and onions. The guy manning the grill was very, very nice, and it was great to sit outside and enjoy the fresh Upcountry air. Local Food, Lahaina: Love this tiny shop in a strip mall in Lahaina with lunch plates. I’m a big fan of their shoyu chicken. 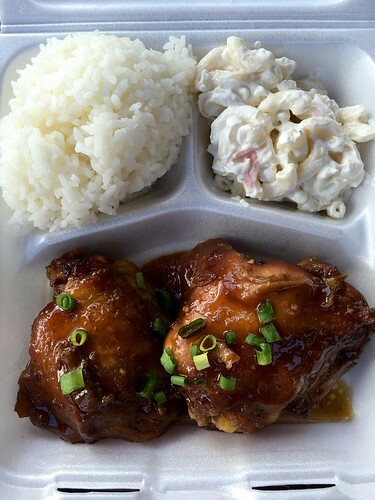 Satisfying plate lunches with a scoop of rice and mac salad, eaten on a picnic bench outside. My husband got the kalua pork with cabbage, and they’ve taken to mixing a ton of cabbage into the pork. I think we wanted more pork than cabbage. The shoyu chicken was better. Morimoto, Wailea: Sat outside by the pool. We weren't very hungry and stuck to just entree, without appetizers or dessert. I loved the seared yellowtail with runny egg and vegetables on a hot stone pot, mixed table side. We also ordered the angry chicken which was good but a large portion and a little hard to eat due to its size. I love the vibe of the Andaz at sunset. Saw some whales off into the distance during sunset as well. Migrant, Wailea: We had a very unfortunate dinner here. Sat at the bar. Restaurant said they were very busy. It took over 40 minutes for our food to arrive, because the kitchen was so backed up. The first pina colada we ordered was watery and consisted mostly of ice. The replacement one was mostly rum instead of being a balance of tropical flavors and alcohol. Neither drink actually tasted of coconut or pineapple. My chicken and waffles was a bit of a mess since the chicken component consisted of Korean chicken wings, and without very much meat on them. The waffles were quite dry, and the only butter and syrup included was what was already on the plate, so I couldn't moisten three with additional syrup. A lot of work for a bit good dish, and I was hungry again later. At least the pork dish and brussels sprouts side my husband ordered was good, but not good enough to make up for the long wait, poorly made drinks, and badly conceived dish I had. We are never going back to Migrant. Only Honolulu Cookie Co. cookies made it better afterwards. 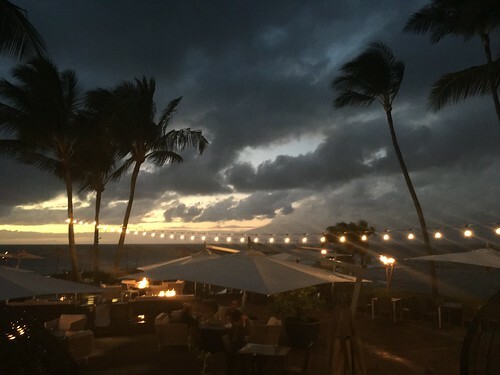 Feast at Lele, Lahaina: Overall the Polynesian review here was great, the service was nice, the overall experience was wonderful, the sunset was great, but the drinks were only OK and the food was mostly solid “for a luau” with a few mis-steps. Pina colada and lava flows were decent but their Mai Tai was like cough syrupy liquid made from the bottom of the maraschino cherry jar. Gross. We loved the banana and sweet potato chips with dip you start with. 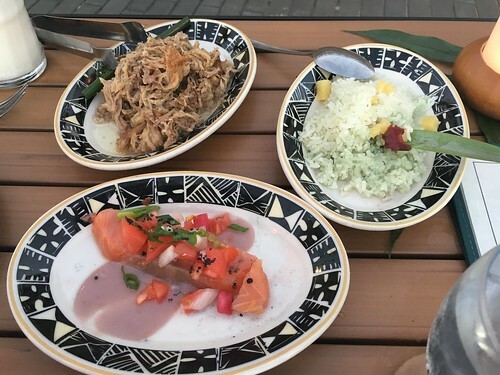 The Hawaii course of kalua pork, a scented rice, and lomi salmon was excellent. New Zealand was pretty good as well with kiwi marinated braised short ribs. Tahiti fell short of expectations with a gluey, paste-like poisson cru and dry, overcooked jumbo scallop. Samoa was better and I loved the coconut cream corned beef, but the fish dish was underseasoned and also overcooked. And the plated dessert was nothing memorable, a duo of hibiscus cake paired with chocolate cake. But I really enjoyed the show, private tables, lei greeting, beatific setting, and performers, especially the fire dancer (who was very close to us in the front row). Monkeypod Kitchen, Wailea: Loved our meal here, as usual. Started with the raw bar appetizer. 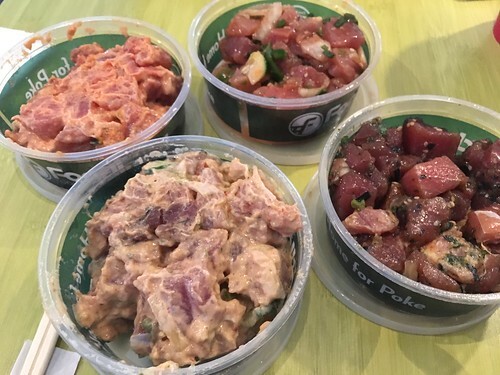 Amazing poisson cru, tako poke, and ahi poke sampler. Fresh and delicious. 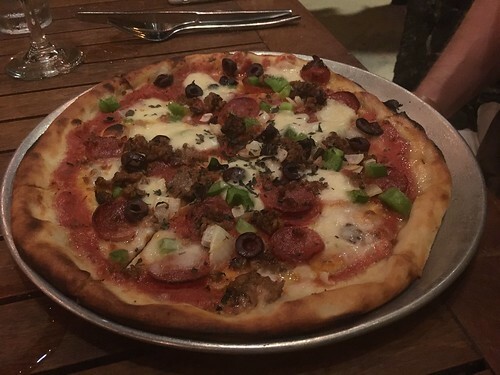 The Proletariat pizza was great (pepperoni, all natural sausage, onions, green peppers, olives, fresh mozzarella) as was the onaga special, served with tomatoes, a pesto based sauce, butternut squash cubes, and a bed of brown rice. The simple but elegant O.G. daiquiri was a solid choice (rum, lime, simple syrup, angostura bitters), and I really enjoyed my refreshing Raintree Elixir (Veev acai spirit, coconut water, lime, simple syrup, kaffir lime). Merriman’s, Kapalua: As usual, our best meal on the island. Started with the Hawaiian ahi poke, served on a bed of avocado and Molokai sweet potato chips. 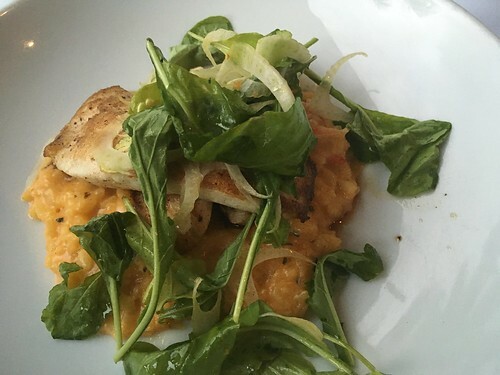 Pristine, fresh fish, and bright and clean flavors. 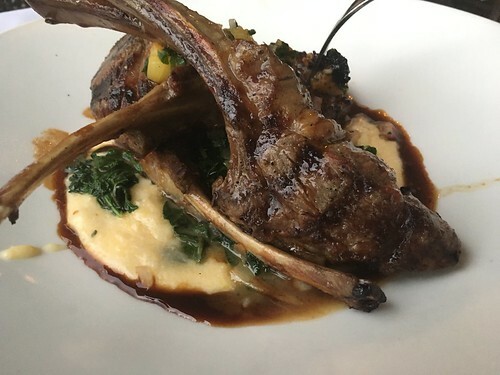 Husband had the lamb chop special on a bed of pureed potatoes and chard (perfectly cooked), while I had the seared fresh fish of the day (opakapaka) served with Kauai shrimp risotto, shaved fennel, and some leafy greens. Cocktails were great, as was service and the view. Finished with the always great white chocolate malasadas with caramel dipping sauce, served in a brown paper bag. I also loved both of my drinks, the No Ka Oi (Ocean vodka, thai basil, honey, lilikoi) and Coco Loco (gin, lime-lemongrass syrup, coconut cream). They also make a great Mai Tai. We were fortunate enough to spend most of the first half of January on Maui and just fell in love with the place (yes, our first visit). 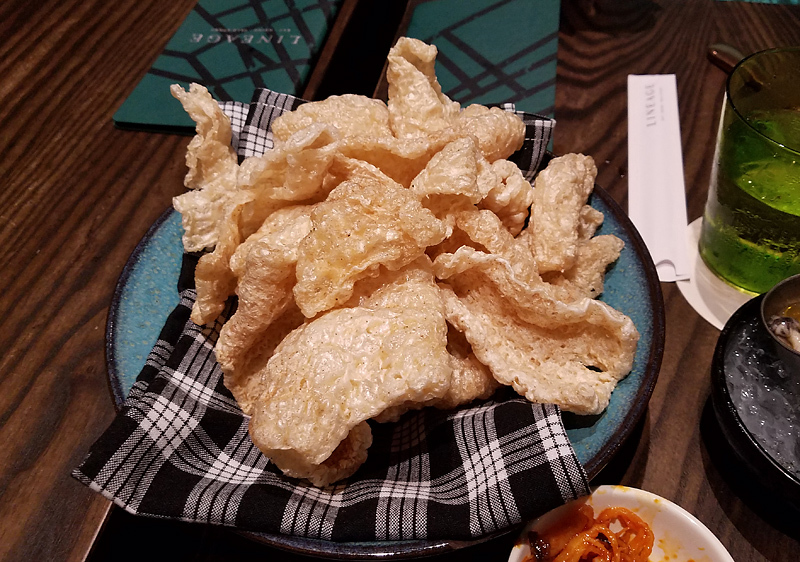 We ate at several of the places mentioned upthread - so thanks, to everyone for the posts and information. I'll continue to circle back and add information about some of the places that have been mentioned and some that have not but I wanted to start out with a place I stumbled upon while cruising around one Saturday morning. This was actually mentioned by kathryn in one of her earlier posts but I didn't connect the dots until later on. In any case, I was going down the road feeling bad, near Kihei, when I spied this sign on the side of the road . . . The stand is open -- on Wednesdays and Saturdays -- in the parking lot of the Keolahou Hawaiian Congregational Church in Kihei. For Maui, pretty reasonable pricing. These spits were twirling really fast. Not a bad view at all . . .
Really glad I stumbled upon this place. I was solo on this morning so when we go back, I'll definitely bring the rest of the family with for a visit. Ooh, can't wait for more! Maui no kai oi (is the best), as they say. Sounds familiar. 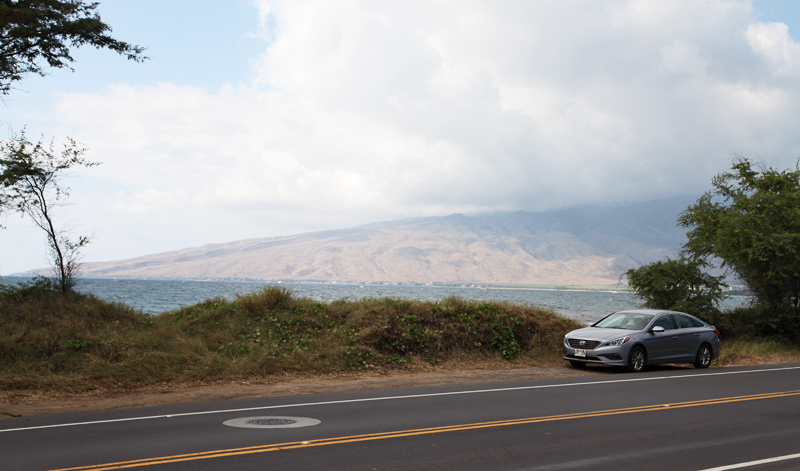 I was in Kauai about three Feb's ago and on a Saturday we were driving to the North. Was hungry and rode by a park on the left and I spied smoke. Did a U-turn up ahead and drove up to the smoke. 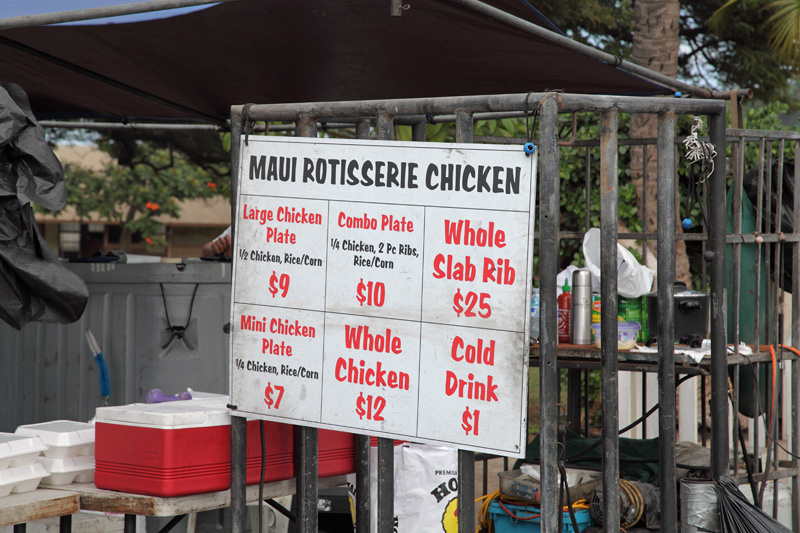 A fella and his wife had a Huli-Huli Chicken Stand open on Friday and Saturday only. Half chicken cooked over a wood fire with brown rice and a salad for $9.00. It was fantastic. This reminded me of that day. A good memory. 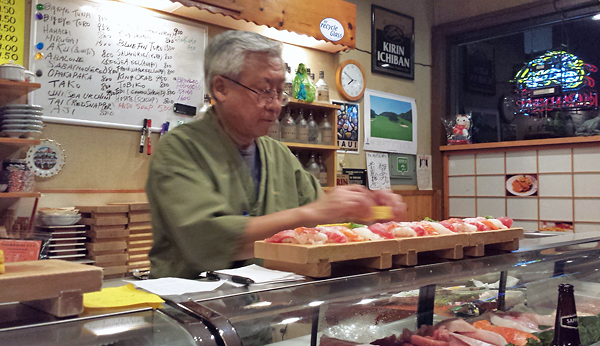 kathryn wrote: Koiso, Kihei -- Great hidden spot in strip mall with very little signage. Wish I'd had the foresight to book 2x! Almost every other patron booked their next dinner here when they finished up. Yes. 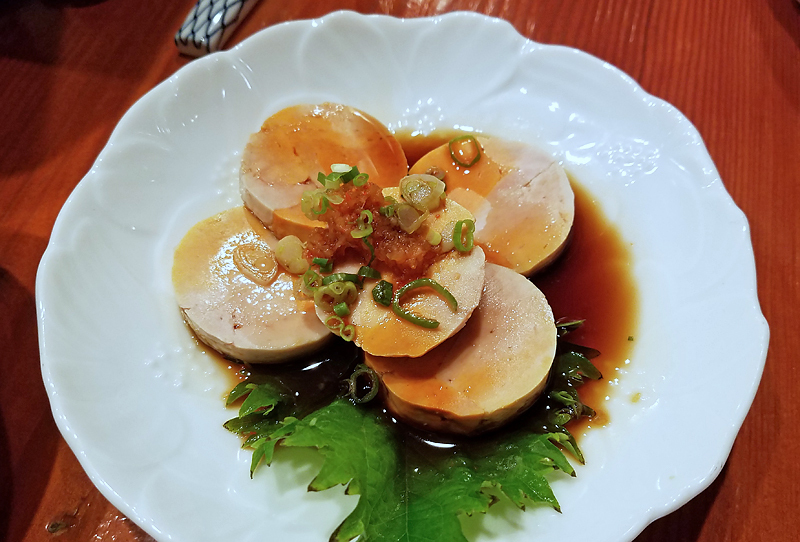 Even though it is completely hidden away, Koiso was recommended by just about everyone we asked (and read). And even though the small restaurant was fully booked during our stay, the bartender at our hotel managed to snag us a reservation for our very last night. 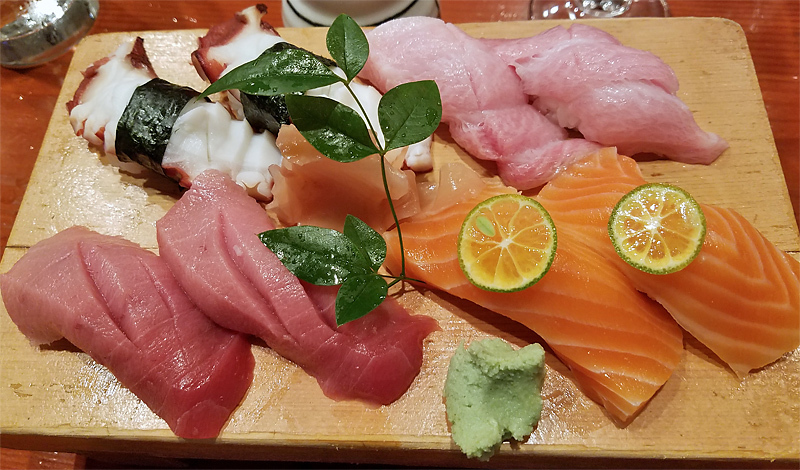 We had plenty of good sushi throughout our stay -- as is posted throughout the Hawaii threads, it's ubiquitous and the baseline is high -- but Koiso was my favorite meal of the trip. 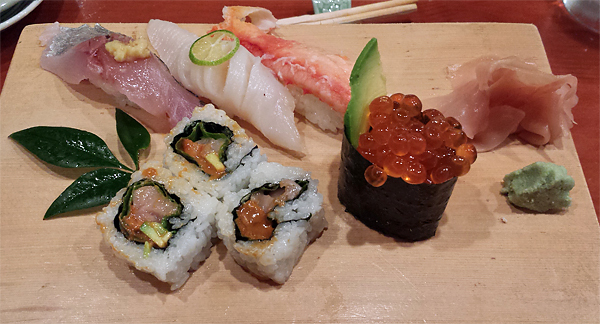 Naturally, we went with the Omakase, which was breathtaking. I apologize for the crappy cellphone pictures. Maybe next time, I'll bring the big boy . . .
We loved this meal through and through. 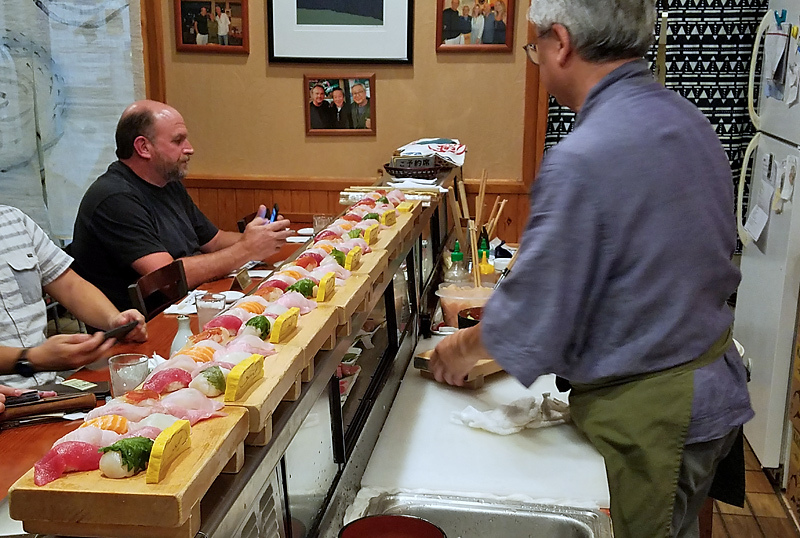 Near the end of it, Koiso was bemused by the fact that we were still hungry and wanted more. So, with his blessing, we ordered a few things we'd hadn't been served yet, that we'd seen served to other diners (collar, salmon skin maki, etc.). Yes, we'll definitely be booking a couple of meals here well in advance of our next trip. This one was a truly fitting end to a life-changing journey. Kihei Caffe - Our usual first stop, especially when we wake up at 5am Hawaii time after a long travel day. Also our typical last stop on departure day. The surfer sandwich was a hit, once again. Ciabatta with eggs, bacon, tomato, and avocado. Some days I just had some scrambled eggs, bacon, Portuguese sausage, or a macadamia nut cinnamon roll which hit the spot. One day, they had a fabulous thick cut Upcountry black pepper bacon as a special. Awesome! And my all time favorite plate there is the cinnamon roll slam: Cinnamon roll French toast, eggs, and bacon. Wonderful with some coconut syrup. Cash only, and get there early to avoid the crowds. We also love chatting with the guy behind the coffee counter. He's always extremely helpful and patient because, as he says, "nobody's had their coffee yet!" Nalu's South Shore Grill - Also a nice place to dine, with pineapple "spa" water, and excellent service. I love the open air feel. I liked my island pancakes with banana, macadamia nuts, pineapple, and rum sauce, but the pancakes weren't as fluffy as other places on the island. My husband enjoyed his eggs, bacon, and kimchee. And the black lava salt on the scrambled eggs is a really nice touch. 808 Grindz - Super cheap, large portions, and wonderful food. 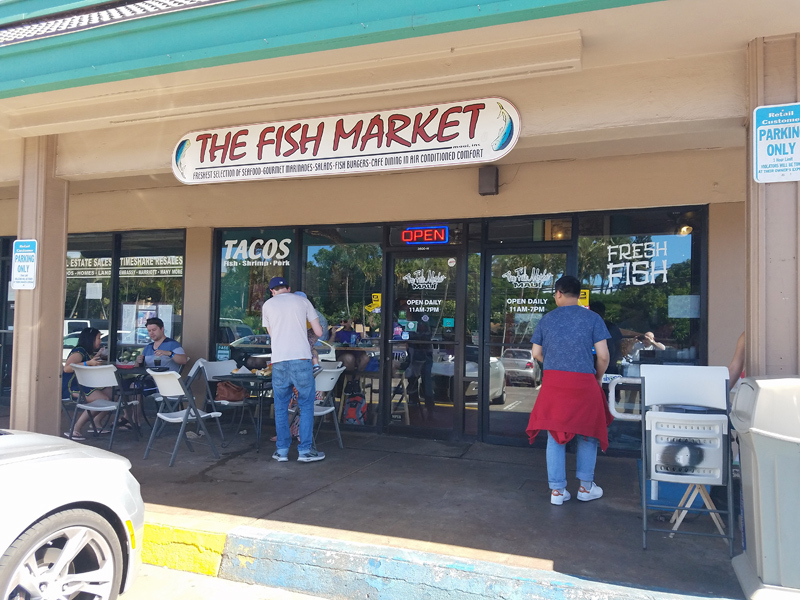 This is a mostly takeout spot in Kihei with outdoor tables in the Safeway shopping plaza (the Lahaina location is a full service restaurant). I love their fluffy, piping hot macadamia nut pancakes with mac-nilla sauce. They cook the pancakes with the nuts tucked inside the batter, unlike some other breakfast places. And their creamy mac-nilla sauce? This sauce haunts my dreams. Amazing pancakes. Better than Gazebo, in my opinion. Donut Dynamite - It's not a secret that we are huge fans of Madame Donut and her husband Frank. Her new Wailuku storefront is small but allows them to make many many more flavors of doughnuts, including savory egg and ham donuts, the occasional off-menu donut (like a croissant-donut-malasada hybrid), fritters, breakfast buns, and the sandwich buns for Tin Roof. Madame Donut posts the menu to Instagram each morning and if you snooze, you lose! All her donuts use brioche dough of different varieties. 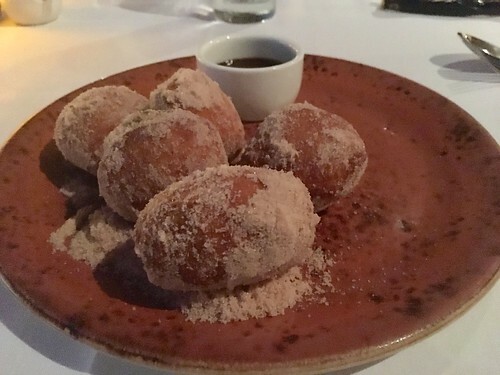 My husband's favorite is the lilikoi malasada. Pumped full of luscious lilikoi custard right when you order it. She makes them every Monday and Saturday, and they're also available at the Saturday Swap Meet. 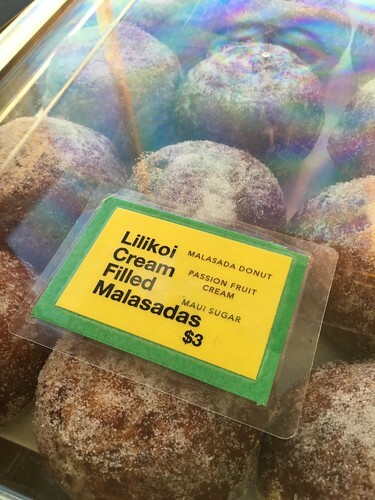 We like the haupia cream malasadas also. I branched out this time and tried some of her other creations. Loved the Maui vanilla bean, elegant and simple. The moringa glazed on dark chocolate brioche with crispy rice puffs was a treat, as was the almond cocoa nib on chocolate glaze. Perhaps the best non-malasada donut was a calamansi donut with candied ginger chunks and fresh lime zest, though the strawberry rose donut made with candied rose petals & fresh Kula strawberries was a beautiful specimen as well. Salted caramel on a chocolate based brioche was also excellent as was the brown butter donut with a spiced crumble topping that reminded my husband of cinnamon toast from his childhood. On another day we tried a brand new doughnut with dulce de leche with chocolate squiggles on top, all on a tender cookie dough brioche base. Fantastic! Another thing I love is that Madame Donut also uses local poi in her dough for some flavors. We were there when she was waiting for some local avocados to ripen, so she could use them in her donuts. Tried an avocado and fresh coconut flakes on poi brioche donut a few days later. Yum! She also makes a great Molokai sweet potato on the same poi brioche. We stopped in for cheeseburger malasadas (!!!) for lunch one day and they didn't have them just yet ... so we just had to get a juicy, fragrant, blueberry thyme fritter with lilikoi glaze instead. Ugh, what a mess! Anyway. The crumb/hole structure and texture of these donuts is unbelievable, as Madame Donut ferments the brioche overnight. And the donuts are not overly sweet, either. I really love her creativity in using local produce and ingredients, and incorporating things like turmeric, miso, poi, ginger, sweet potato, avocado, etc.. And she's a total sweetheart as well. Fabulous donuts. We often planned our days around what donuts she had available especially on Malasada Monday and Fritter Friday. Closed Sundays. Pono Pies - These locally made pies are available at places like Tin Roof, Mana Foods, and Whole Foods. We tried both the lilikoi and the chocolate coffee. The baker uses local ingredients like macadamia nuts, honey, coconut, and more, creating desserts without any added sugar (and they're gluten and dairy free as well). A crumbly nut based crust and lots of local products. These were great, and not just as a healthy dessert. I believe he's also using Mill House Roasting Co. coffee for his coffee flavor. Yum! Maui Pie - Their lilikoi cream pie with whipped pie was awesome and available at the Ulupalakua Ranch Store. Beautiful yellow pie in the case... I knew when I saw it, I was sunk. And it was definitely worth the effort. Great flaky crust. Sugar Beach Bake Shop - The third kind of lilikoi pie we tried. Lilikoi plus key lime! Located conveniently next to the Ululani's in Kihei. Mmmmm. Passionfruit and key lime are a match made in heaven! More of a graham cracker crust here. Lappert's - Aunty Lilikoi's passionfruit sorbet was intensely flavored. Like a slap in the face with lilikoi. That and the caramel coconut macadamia nut were both delicious. Pricey, but delicious. I tried Tutu's Anniversary (lilikoi and raspberry sorbet with coconut ice cream) but it was too sweet for me. Hawaii Gelato - Ono Gelato was out of lilikoi so we "settled" for their delicious lilikoi gelato. Airy and fresh tasting. Their Lahaina Sand was also very good. Salty caramel with peanuts, macadamia nuts, and coconut. Enjoyed this more than Lappert's. Ululani's - Our favorite shave ice. 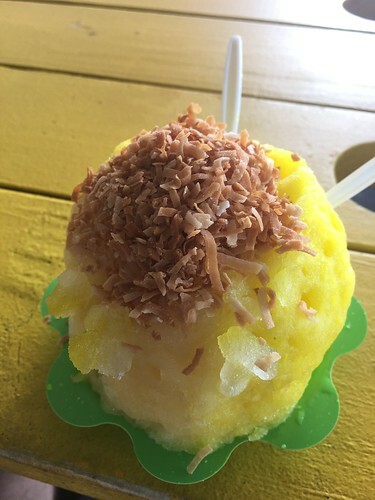 Pineapple, pina colada, lilikoi, with macadamia nut ice cream on the bottom, and snow cap and toasted coconut on the top. I love how they give you more syrup if you find a white patch in your shave ice. And they also carve out a little pocket at the top of the shave ice so the toasted coconut flakes don't fall over everywhere. Perfection. Hana Hotties hot sauce - We went to their stand at the Swap Meet and tried all the flavors, declaring the pineapple the best, which surprised me. I would have thought it would be lilikoi, but I guess not! Maui Gold pineapple - The best. The best. The best. The end. Local avocados - These are avocados the size of your head. Way better than the Mexican variety. Creamy, buttery, and good for at least 4 servings. Insanely large! And delicious! Maui onion, chili peppah, and Kona coffee glazed mac nuts - I can't decide if I like which flavor I like more. Hard choices, I know. So tasty. Hawaiian Host Tropical Fruit Bites - Coconut, banana, or pineapple pieces covered in chocolate? Be still my beating heart! Why have I never eaten these before?! I was only going to buy one bag, but that plan went out the door with the second bite. And Foodland had them on sale, two bags for $7. Wheely's - Organic nitro and cold brew at the Swap Meet. Cold and refreshing but they only have almond milk, so not my favorite. Very cute coffee cart concept. Pekelos - Picked up half a pound of coffee, which was good. But not my favorite, even if it is very good. The Song of the Whale blend is seasonal, roasted only during the winter. They're at the Swap Meet every Saturday. Belle Surf - We stopped in for a cute iced coffee served in a mason jar. Strong, tasty, but I miss the previous owners (coffee seemed a bit better when they were around). Sat on a couch outside in the courtyard and watched the clouds. Note they're closed after 1pm most days. Maui Coffee Attic - Good coffee, they serve Maui Oma. Kind of an odd set up with a lower level with a stage, and an upper level with a TV. I saw also they frequently have live music and magic shows. Very nice service. Grandma's Coffee House - We were stuffed and were able to resist the siren's call of their pastries and other desserts, opting instead for a nice strong cup of coffee on the patio, while the local cat snoozed next to us. I like their coffee a lot and it really hits the spot after coming down from Haleakala. Mill House Roasting Co - The house blend that was partially Maui grown and Nicaraguan was good, but the Peaberry Red Catuai was out of sight. We had it done as a pourover. Really worth the effort to find this blend. We also bought the last bag on the shelf in the gift shop that day, then went back for more a few days later. Mmmmm. Probably my favorite Maui coffee behind Aina Gourmet's Coffee. Aina Gourmet Coffee - Picked up a pound of whole beans of Red Catuai at Pacific'O on Front Street to take home (no coffee service/shop here). Had it at Honua Kai a few years ago and loved it. Akamai Coffee - I love their new space in Kihei. Very nice service, We had gone to the little drive thru stand in Kahului many times. Very spacious and wonderful "living" walls. I could sit there and relax on their indoor swinging chairs all day. I tried their great 24 hour cold brew (toddy style). It's their tenth anniversary this year! Ono Gelato - Stopped in on a rainy day for some 100% Maui coffee which hit the spot. Very smooth, perhaps not as strong as others I've mentioned. They were out of Lilikoi gelato. MauiGrown - Tried their Maui Mokka this time, an award wining bean of theirs. Tasty, but I think I prefer Mill House's coffee a little bit more. Very friendly counter folks. And we perhaps might have run into Sheldon's wife Janice, three daughters, and grandpa Simeon (visiting from the Big Island) who were picking up buns at Donut Dynamite and told them how much we LOVE this sandwich. Cannot wait for Chef Simeon's new place at the Shops at Wailea!! 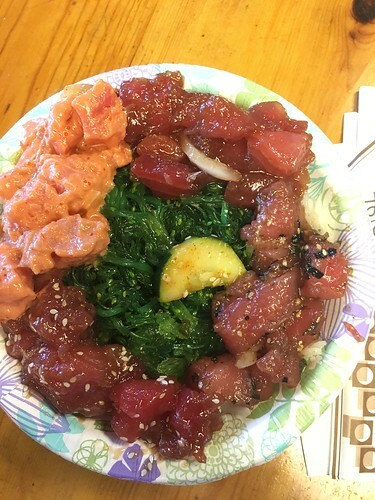 Tamura's - Very randomly located spot for their new Kihei location but the poke is worth it. Loved the poke bowls over white rice with furikake. We had the sunrise ahi poke, which is spicy tuna poke in a creamy sauce, with eel sauce on top, furikake, and chunks of avocado hidden underneath. Really nice even if service is a little odd/cold at the food counter. Also, a good place to pick up liquor, wine, snacks, mixers, and more. Eskimo Candy - Our go to poke in Kihei even if they are only open weekdays. 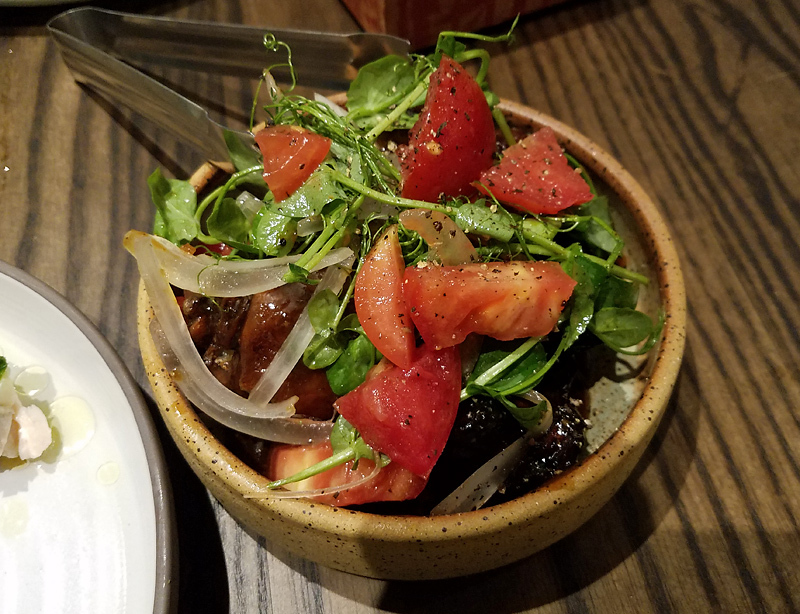 The typical order is a poke bowl with shoyu poke, wasabi poke, furikake poke, and spicy poke, served with a little bit of wasabi aioli, and seaweed salad, which brings it all together. Delicious. Love that wasabi aioli. Poi by the Pound - A small amount of shoyu poke came as a side with our Hawaiian. Fresh, tasty. Too small a portion to really say more but I enjoyed it. Tin Roof - $6 for a spicy chicken sandwich on a Donut Dynamite brioche bun is a steal. Juicy, tender chicken thigh, with crunchy cabbage slaw. And when they say extra spicy, they mean it! Yum. Bring wet naps! A fantastic deal. Grabbed another with extra dime bags of furikake on the way to OGG. I dream of this sandwich. 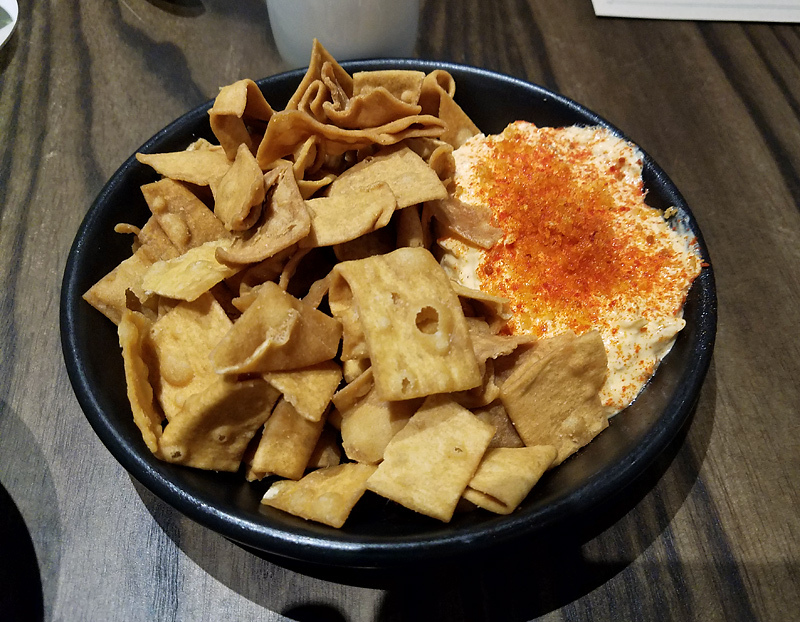 Pint & Cork - While having some great cocktails, we had these killer deviled eggs during happy hour. Bernaise sauce with crumbled bacon, spinach, and parmesan. These eggs were so overloaded with toppings, you had to use a knife and fork. Not that I'm complaining! We were also eyeing the mac and cheese next to us... $5 during happy hour. 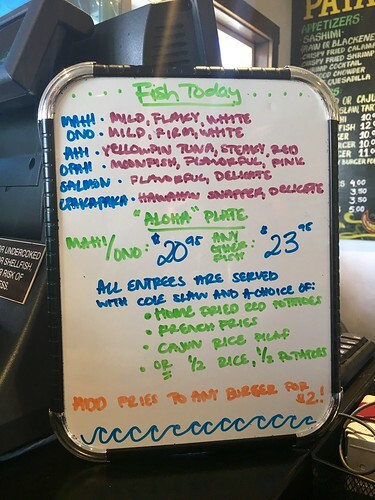 Coconuts Fish Cafe - Kamaole - New location above the Whaler's General Store! So much more space. We had the fish tacos with south of the border sauce, which turned out to be more of a creamy chipotle sauce (yum) as well as the taco salad. I'm a new fan of the taco salad because you can taste so many more of the components: fresh salsa, roasted spicy salsa, mango, creamy coleslaw, big chunks of fish, and more. It's great to have a more spacious second location and I saw that they also have breakfast now as well. 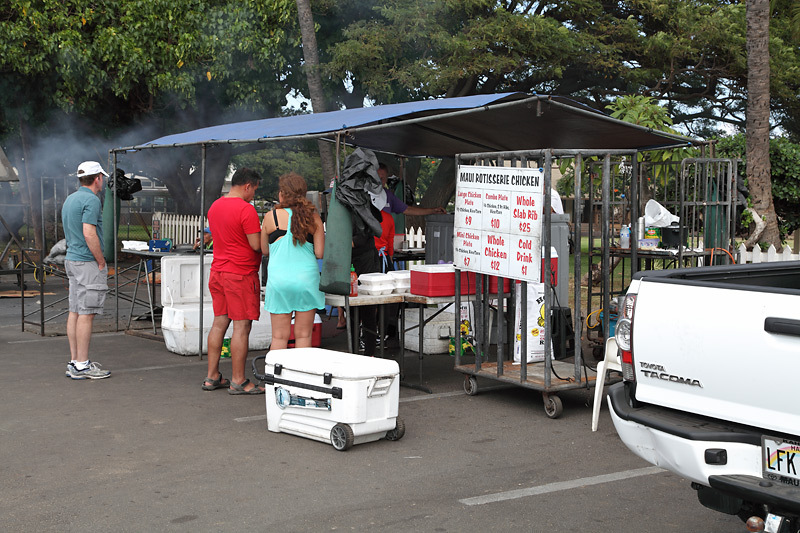 Paia Fish Market - While the line is long, don't let that dissuade you from their awesome food. My husband had an excellent seared ahi tuna over a mixed greens salad, served with two cocktail shrimp on the side. I adored my Obama burger, which was seared Cajun spiced Ono, served with cheese, lettuce, tomato, and wasabi butter. 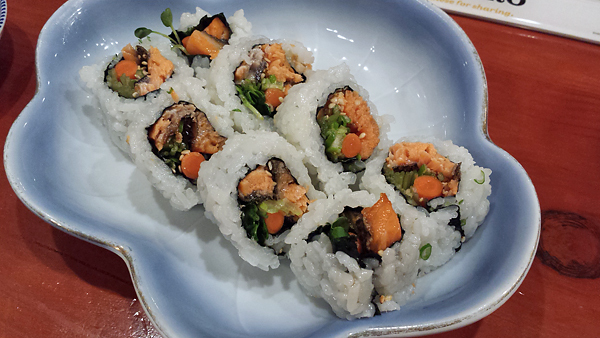 It was just spicy enough to have a kick but didn't overpower the Ono. Shark Pit Social - Their $10 "Hang Ten" lunch menu is great! Tacos, plate lunch, poke bowls. We had the fish tacos with crunchy red cabbage, a spicy & creamy sauce, and delicate chunks of fish. 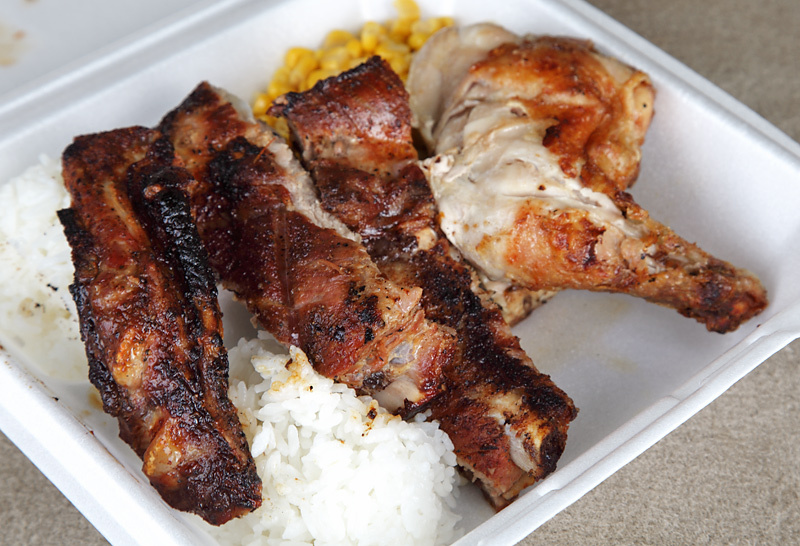 The kalbi chicken plate special was also very good -- meaty and savory. Loved the fried rice with corn and chunks of spam as well. Yum! Star Noodle - Very busy on Sunday for lunch. Sat at the communal table next to a couple from Portland. We loved the ahi avo - bright and refreshing with lemon pressed olive oil. The kalbi was awesome, with pickled red onions, Asian pear, and kimchee. 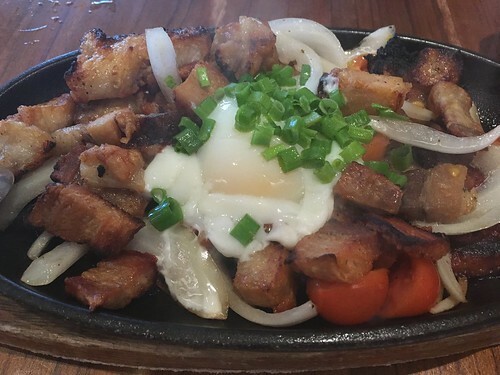 Loved the Filipino "Bacon and Eggs" with wonderful Maui onion, local tomatoes, gooey egg, and big chunks of bacon. The tomatoes were out of sight, particularly. The Brussels sprouts were a little odd, served on a smear of kimchee puree, a bit of bacon, and Korean chile powder. They could have been cooked longer and more caramelized. 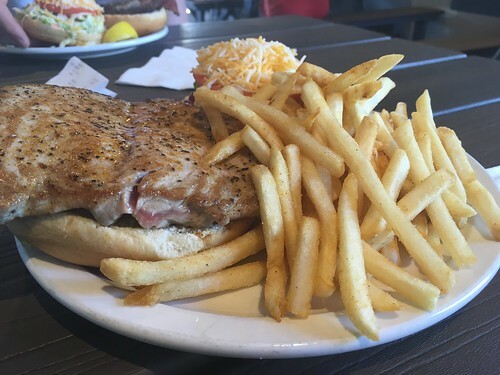 We have liked this dish more in the past. I also recommend making a reservation on SeatMe to avoid the long wait. Poi by the Pound - Grabbed takeout one day and took it back to the condo. It held up pretty well in our Whole Foods collapsible cooler bag. One Hawaiian plate plus plus a small squid luau came out to about $24 and easily fed two. This plate includes lau lau, kalua pork, chicken long rice, mac salad, rice, lomi salmon, poke, and poi. The lau lau was moist and fatty. 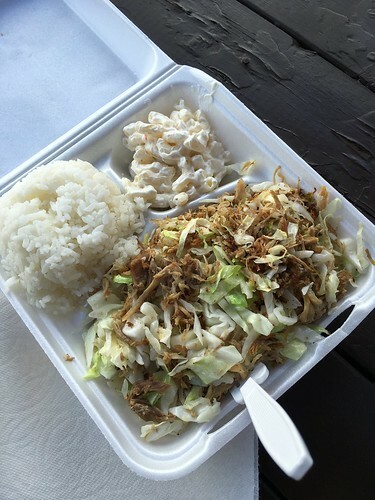 The kalua pork was very good, and even better with some poi on top. The warm chicken long rice was comforting and filled with ginger. Their mac salad is great -- creamy with lots of fresh herbs. We joke that it must have crack it in, it's so good. But my absolute favorite part was the squid luau with tender chunks of squid, in a delicious green stew. Delicious! Outrigger Pizza - Loved this mobile pizza cart on past trips and this was no exception. Individually sized $10-12 wood fired pizzas with Naples inspired charred crusts. Lilikoi drizzled over kalua pork, bell peppers, and onions, with a garlic aioli. And an awesome spicy buffalo chicken pizza with ranch dressing and hot sauce. Talked story with the guy manning the oven as well about how his folks come and visit Maui 1-2 months at a time and crash at his place (yikes). He also mentioned they do a lilikoi drizzle on a lot of their other pies! Cow Pig Bun - DH loved his house burger on focaccia with bacon garlic aioli, gruyere, arugula, caramelized onions, balsamic glaze. While I adored my bourbon barrel sauce burger with cheddar and bacon on brioche, with a fried egg and pickled jalapeños. Both were very good, full of flavor, and very messy. Great tater tots with sriracha aioli as well. Monkeypod Kitchen - I immediately zoned in a new pizza that had not been there on previous trips. The kalua pork and pineapple pizza was a winner, with jalapeño and macadamia nut pesto. So ono! 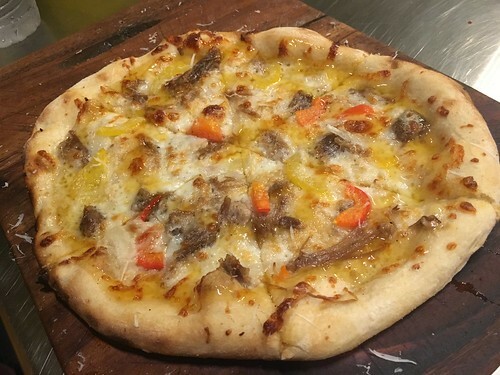 Meaty, fruity, spicy, nutty, and herbal all at the same time, combined with a nicely chewy pizza crust. My husband's onaga was also excellent served with a delicate lobster and fresh sweet corn flauta on the side. The roasted squash and tomatoes were bursting with flavor. The tomatoes on Maui rival New Jersey's best in August, I swear! Plus his dish had a great eggplant caponata on top. We were stuffed, so no room for dessert. We always have good meals here and this was no exception! Humble Market Kitchin - This is a brand new restaurant by Roy Yamaguchi that took the place of Migrant at the Marriott in Wailea. It's newly renovated and shows. We started off with complimentary edamame and this might be the best edamame that I've ever had -- tossed with sesame oil, shichimi togarashi, sugar, and salt. I'm definitely recreating this at home. 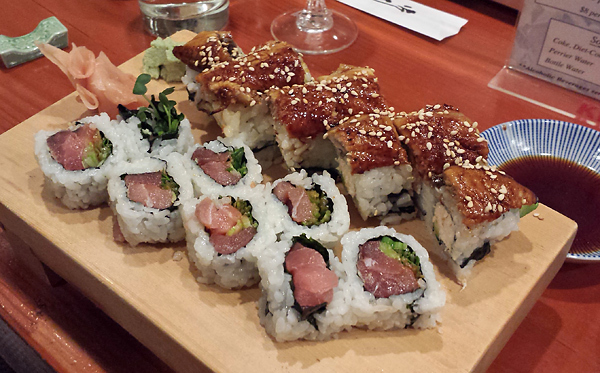 The menu is long and varied with everything from Maui comfort food to oysters to sushi. To start, we shared the crispy Brussels and cauliflower with pepitas, queso fresco, and cilantro lime aioli. This was an awesome dish, and I could have licked the bowl clean. 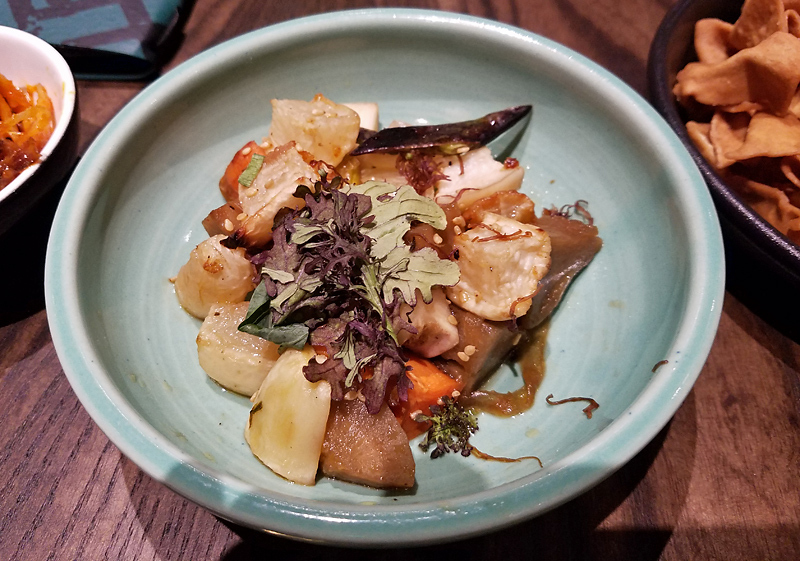 Then I went straight for the clay pot cod, served with fragrant sticky rice on the side, with a pile of scallions, shiitake mushrooms, Chinese sausage, baby boy chop, and matchstick ginger complimenting the tender, moist cod perfectly. I nearly had a ratatouille moment when trying the side of rice -- it tasted like the Chinese zongzhi (sticky rice wrapped in bamboo leaves) from my childhood. My husband's medium rare ribeye was also delicious. Fatty, tender, perfectly cooked, with a little bit of "chili peppah" heat in the sauce. Fantastic meal, great service, and we were way too full to even try the chocolate soufflé we saw on other tables. Look forward to returning! Mama's Fish House - We both skipped the appetizers and went straight for entrees. My husband had the fish curry in coconut milk, served with sides of macadamia nuts, fresh banana slices, mango chutney, and an Asian chili garlic dipping sauce. He also added on a side of luscious and smoky kalua wild boar. The Penang fish curry was good but a little sweet and also the fish was overcooked. I ordered the grilled ahi, cooked in a ti leaf. The waiter did not ask me about a temperature preference so by default it came medium-well, with only a tiny bit of kind of pink in the middle. Grrrrr. 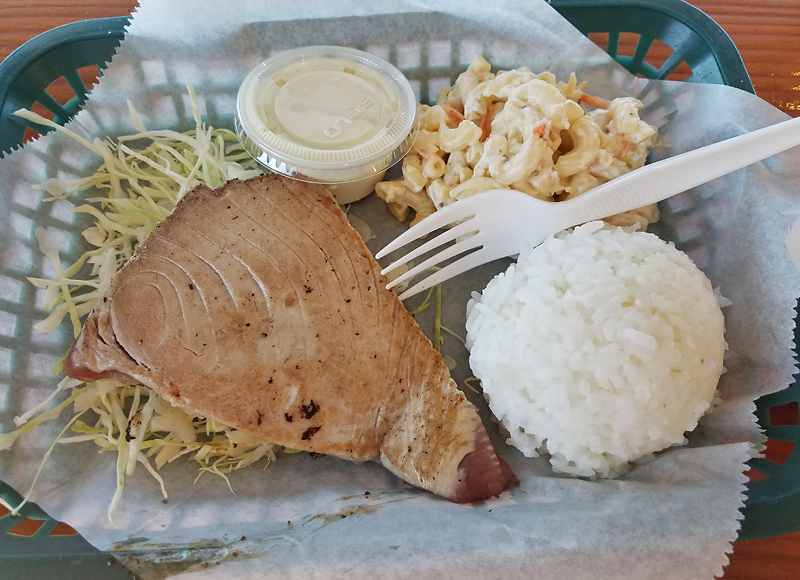 The ahi was good and a little bit spicy, due to a glaze, and came with a grilled banana, some coconut rice, and a small dish of papaya. Overall, it was too much sugar/fruit, especially since I also ordered a side of octopus luau (very good but super sweet), and I would have preferred my ahi medium rare or rare (which I don't think they do unless you proactively ask for it). Our server also seemed to be a bit "on the spectrum" and with a very flat affect. It was a good but not great meal. Certainly not as good as others we had on the island. If I go again, I will specifically request medium rare or rare for my fish since they don't offer or ask. The Restaurant at the Hotel Wailea - This was a great meal. Started with the ginger rubbed octopus, with coconut and scallion oil, which was cooked sous vide and then charred for crispness. Very tender and flavorful. We also had the amazing foie gras terrine with Kula strawberries and onions. Beautiful piece of toasted brioche, sprinkled with pepper. An inspired pairing: foie, strawberry, onion, brioche. Next up was a gorgeous, crispy piece of onaga for me, with cauliflower purée, roasted cauliflower, tempura asparagus, rounded out with a sauce vierge. As well as a gorgeous ruby red nori ahi with a fragrant tosazu sauce, a Japanese dressing of bonito stock, rice wine, and soy sauce, plus sesame. The chef recommended that the ahi be served rare and it was barely seared on both sides and a deep red in the center. All of these dishes used as many local ingredients from Maui and the Big Island as possible, which I really appreciated. Dessert was a stunner. We got the sampler: a molten chocolate lava cake, served with honey marshmallows and banana crunch ice cream and cookies; followed with a mango bar with hibiscus gelee on top, a fried Molokai sweet potato ball, and coconut meringue; last but not least was the tropical fruits platter with melon, kiwi, strawberry, starfruit, papaya, pineapple, what I think were tiny coconut milk caviar...and papaya sorbet as well as coconut sorbet. Fantastic, and we would definitely come back. Great service, wonderful panoramic views, and great good. Would definitely return. Fabulous experience. Mill House - We had a great meal here also! The house made Parker rolls were a good start. We had the kalbi beef with a green papaya and carrot salad, over some sliced tomatoes and smoked macadamia nut butter. Crisp and refreshing with an East Asian/SE Asian bent. Next was the warm pork belly served over hearty barley, with a pineapple glaze, cured egg yolk, pickled ooh. Sweet and gooey and comforting. Delicious! 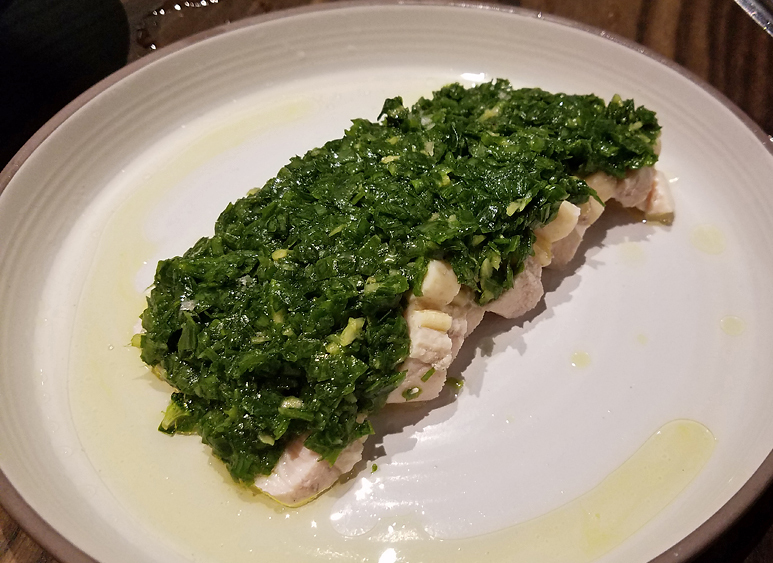 For mains, we had the kanpachi with nước chấm, cucumber, basil, mint, cilantro, cashew, which was perfectly cooked with a crispy skin, and bright Vietnamese flavors. The cioppino with kampachi, kauai shrimp, mussel, and dashi broth was also very good, with a slightly spicy tomato broth. But the really standout item was dessert: a "hurricane" popsicle with dulcey chocolate mousse on a stick, sitting on a bed of furikake caramel corn and butter mochi squares. Wow! Crunchy, salty, savory, buttery, and rich. The views of the West Maui mountains and their pond, with tiki torches, was also quite nice, even on a cloudy day. Definitely want to try the chef's table next time! Ka'ana Kitchen - Started with the ahi tataki, served with burrata, lilikoi, and local tomatoes. A perfect combination of flavors. We also loved the pork belly, with pickled grapes and chive spaetzle. Another inspired pairing! The fish of the day was opakapaka, served with radishes and sofrito, very tender and sweet. And another great dish was the buttermilk fried chicken with a big chunk of mochi waffle, and delicious creamy sauce on top. I still find the menu confusing but service was great and this was a very good meal. Morimoto - Sure, you can find Morimoto elsewhere but my husband loves it and I sure do love eating here by the pool under the stars with one caveat: no ordering any sushi! The best stuff they serve is all cooked. We shared the pork gyoza which came with a very crispy bottom layer -- six dumplings all stuck together. They were sitting on a bed of roasted tomatoes and a pool of lots of bacon foam. Gimmicky but fun. I had the duck duck goose entree which consisted of duck confit, duck breast, duck fried rice, and a duck meatball in a tiny cup of broth, which was excellent. 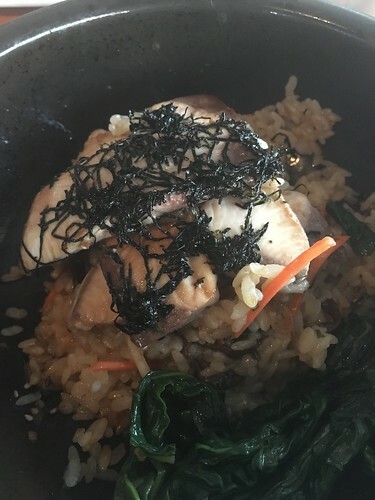 My husband loved his usual, the yellowtail in a hot stone pot, seared tableside. Delicious. Merriman's - We had the prix fixe menu on Valentine's Day here. Started with a tiny cup of tomato soup with curry, kaffir line, coconut. Plus warm whole wheat bread and a tomato and olive oil sauce for dipping. So tasty! Next I went with the Ono jalapeño corn cakes with papaya salsa, in a chili pepper, garlic, and coconut sauce, for my appetizer. Tasty but a bit "Mexican" tasting which I did not expect. My husband had the local tomato, fennel, and onion salad, with fried capers. Fantastic. Local tomatoes really stole the show this trip. For my main, I chose the spicy macadamia nut encrusted mahi mahi. Also amazing! Charred broccoli with mushroom sauce were the best broccoli I've ever had. Hawaiian vegetables, brah! Broke da mouth! Husband chose the filet of beef with the best garlic mashed potatoes of all time. Even the garlic here tastes better. Finished up with the Maui pineapple and macadamia nut bread pudding. I was stuffed and only ate about a third of this. DH inhaled his buttermilk panna cotta parfait with Kula strawberries. A great meal, start to finish. Pint & Cork - Newish gastropub in the Shops of Wailea. Felt a bit out of place next to the Gucci and Tiffany's stores but the service was great, as were the drinks. The Deconstructed Lava Flow with rum, coconut cream, and muddled strawberries was excellent and not overly sweet. My husband loved his Polynesian Paralysis with two kinds of rum, including Koloa Coffee Rum, and coconut cream. Earthy and creamy. We also tried the Smoke & Mirrors with tequila, mezcal orgeat, and lime, and a spicy and fruity salt rim. We came back another time and tried the Batidinha, a caipirinha variation with cachaca, coconut cream, freshly muddled limes and raspberries. Their Trader Beach Mai Tai was also very good with Whaler's dark rum, Zaya rum, orgeat, and an absinthe wash. This was good but we liked the Son of an Itch even more, a mixture of rum, bourbon, and lilikoi juice. Two thumbs up both visits. And the power and USB outlets and under the bar are so thoughtful. Humble Market Kitchin - The cocktails were less good here. Overly sweet, and not very balanced. The Magnum PI with bourbon, passion fruit, orange, lemon, and pineapple needed more acid/bitters. Same for the Mac Nut 44, with rum, curaçao, lime, almond, and macadamia nut. Just seemed like rum and juice, without enough acid/bitters. Monkeypod Kitchen - Went back to an old favorite, their fabulous Mai Tai with two kinds of rum, macadamia nut orgeat, orange curaçao, and their famous honey and lilikoi foam on top. Perfection! I dream about this mai tai. Mama's Fish House - My husband's Scorpion (a mixture of four rums) was good and strong. Not the best we've had. I ordered a Blue Hawaii, which was passable but a bit unbalanced, as it tasted mostly of rum with a little fruit juice. Eh. The Restaurant at the Hotel Wailea - I had a delicious lilikoi cocktail with Tito's vodka and Lillet Blanc. Well balanced and not too sugary. My husband opted for a traditional Negroni, served on a single big ice cube, a nice touch. Their list is short but seems to have been well thought through. Mill House - Amazing. Loved the The Final Punch (white Koloa rum, brandy, lilikoi, lemon, orange, cold pressed sugarcane) and Espina de la Rosa (tequila, pineapple, lime, Hawaiian chili, orgeat, Peychaud's. But the real winner is the Easy Rider with local Paniolo whiskey, lilikoi, lemon, orgeat, and tiki bitters. We also liked the Prescription which was a base of Angostura bitters and housemade macadamia nut orgeat with mezcal, egg white, lime, and tiki bitters. Very impressive cocktails! Lehua Lounge and Ka'ana Kitchen: I had a special Hennessy cocktail with pineapple aqua fresca and creme de mure which was OK. We also had the Kona Squall, bourbon, aged rum, macadamia nutorgeat, mole bitters. Good but not as good as previous visits. The best drink we had this time was their Mai Tai. The 1944 original Trader Bic version. Strong, not too sweet, not too fruity. And I do love sitting by their fire pit. And the main restaurant had an amazing drink: the Ka'ana Old Fashioned with three rums, sugarcane, and bitters. I would go back just for this (unfortunately they don't have a separate bar for the restaurant). Merriman's - Had both the original Mai Tai and the Merriman's Mai Tai with honey-lilikoi foam. Both were good but not great compared to the Lehua Lounge and Monkeypod Kitchen versions. The daily muddle was a gin lemonade with blackberries and lime, which was better. I also liked the Coconut Lime, with gin, lime, lemongrass, and coconut cream, but it was very sweet and creamy. Somehow the cocktails seemed good but not great. Between all the other places we tried, they have some stiff competition now! But we had an amazing server and hung out by the fire pit for nearly 3 hours. Leblon with cachaca, aperol, calamansi, coconut water, simple syrup, mezcal mist. It was a little watery, and the flavors didn't mesh. Not great, wouldn't order drinks here again. Down the Hatch and Breakwall Shave Ice - these two businesses are next to one another in a courtyard. So OK, it's not really a cocktail. But a $5 piña colada "adult" shave ice with rum, coconut ice cream on the bottom, and a snow cap and fresh coconut on top, for happy hour? Not as good as Ululani's but pretty good for shave ice and a cocktail at the same time. The regular piña colada and lava flows were good as well. Yum! It was an amazing trip and the food and cocktails did not disappoint. In fact, we felt that Maui has stepped up its dining game significantly in the last few years! Thanks for another great Maui post. It's definitely motivating me to plan another trip to the island. Chef Simeon (ex-Star Noodle, ex-Migrant, current owner of Tin Roof) is going to be opening a new restaurant at the Shops at Wailea sometime this year, so that will be one to hit up as well! This is proving to be the best culinary resource for planning an upcoming trip to Maui. Thank you so much for taking the time to chronicle your visits! Very kind of you to put in so much effort and create such a valuable post. TomInSkokie wrote: Very kind of you to put in so much effort and create such a valuable post. +1 THANKS to all who posted in this thread. I realized that I had never posted on our dining experiences the few times we've been to Maui, shame on me. Haven't been to Maui in quite a number of years but thanks to a time share deal, heading over during super high season for 6 days, 5 nights for only $700 at a top Maui resort, have to "put up with" a 1.5 hour presentation but have done that before. stevez wrote: Having been up all night for a photo shoot at the top of Haleakala (elevation 10,000 feet), I was ready for a good breakfast. kathryn wrote: Chef Simeon (ex-Star Noodle, ex-Migrant, current owner of Tin Roof) is going to be opening a new restaurant at the Shops at Wailea sometime this year, so that will be one to hit up as well! any further details on this? Arrived Christmas Day, starving as we are going on 10 hours since we had our crappy banh mi (Dallas airport banh mis are not good!). Not much open, stopped by Fu Lin Chinese on Front Street in Lahaina, it was around 4pm. No need to go back, nothing to note here. Next morning at the breakfast spot by the ocean at the Marriott Vacation Club Kaanapali. $45 for two, scrambled eggs, overly deep fried slices of Portuguese Longuiza sausage, deep fried spam musubi. No need to go back there either. 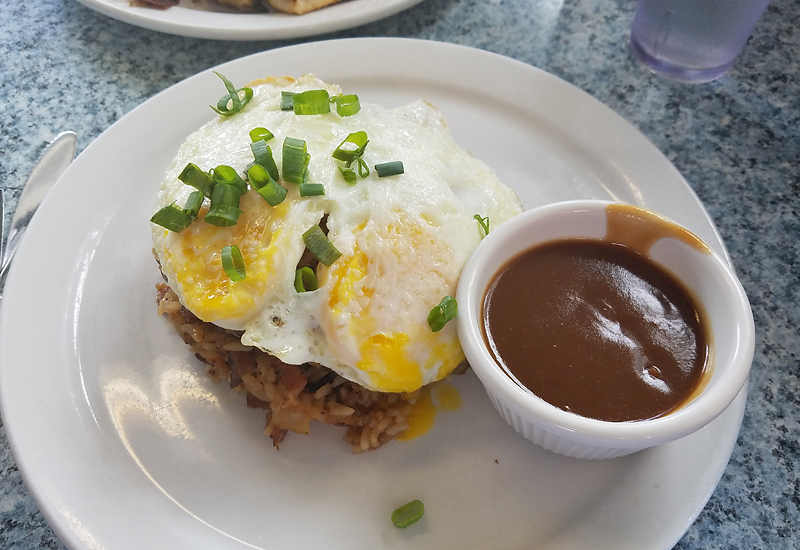 Had lunch at Aloha Mixed Plate on Front st in Lahaina https://www.alohamixedplate.com Puzzling how they had a number of open tables but wouldn’t seat anyone, perhaps a server was ill/out or the kitchen couldn’t keep up. We sat in the bar area, our server was terrific, an older woman with great sense of humor. We had a starter of SMOKED Mahi Mahi FISH SPREAD - Hoaloha Farms tomatoes, cucumber, parsley, and sour cream served with Hoaloha Farms kalo chips. Forget what we had for lunch, it was good. Never did get a “real” Hawaiian plate lunch which I’m lamenting now. Dinner was a Monkeypod Kaanapali/Whaler’s village https://monkeypodkitchen.com/menus/Ka-A ... Dinner.pdf Our starter were the lobster deviled eggs, friggin killer, totally enjoyed these. Sadly our entrees didn’t reach such heights. Mrs Willie had a banh mi burger which was ok at best. 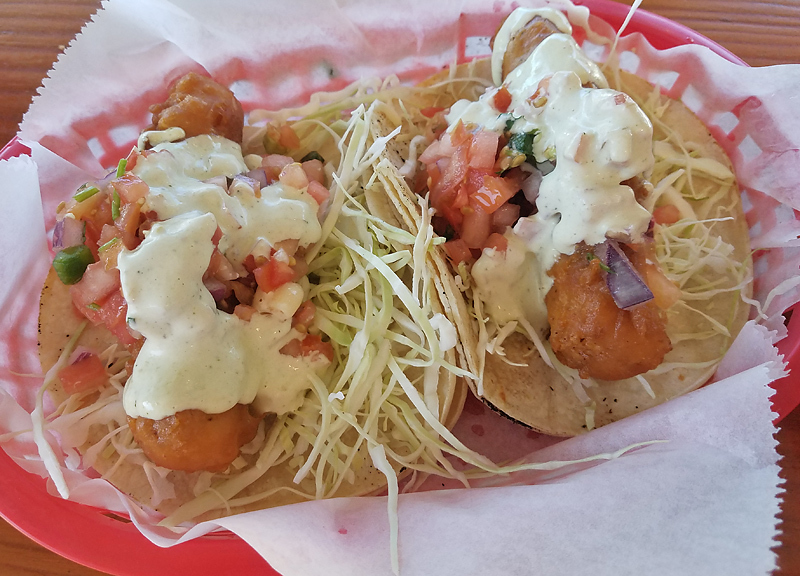 I had a special of fresh caught fish tacos, a single cube of deep fried fish put in center of each taco, not the greatest. Some unique beers we enjoyed while here. Next day we took the jeep and drove to Hana, started at 7am which was great as there were few if any other cars on the road and very few people at the various stops/waterfalls. Before starting we had breakfast at Charley’s Restaurant in Paia http://charleysmaui.com EXCELLENT biscuits and gravy (all homemade, lots of Maui onion in the gravy) We continued around the area where one isn’t supposed to take their rental car, the views/vistas are jaw dropping, well worth it, just don’t make the drive in a low riding car such as a Mustang convertible. Then tried to get gas at the nearby Costco, again must have been a line of 40 cars waiting, no thanks, not wasting my time I’ll pay the extra $0.75 per gallon not to wait. I ended up grilling a number of meals as the condo complex had grills everywhere, was a great way to meet others as well shooting the breeze while drinking a beer. Lots of fresh seafood and great meats to be had from various markets. 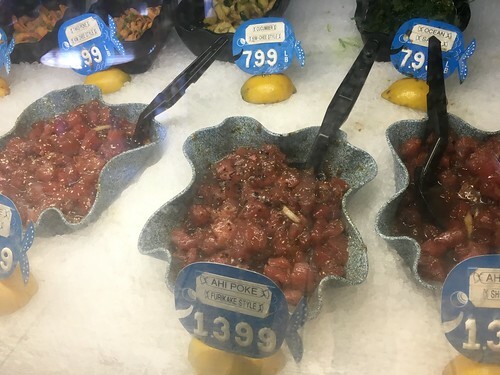 Speaking of markets, don't forget the poke, Safeway, Foodland, both have fantastic poke, many versions. This was a near daily highlight for us!! Was jonesen one morning for malasadas, found The Bakery in Lahaina https://www.facebook.com/pages/The-Bake ... 4094617282 The custard filled malasada was amazing, sure hit the spot. 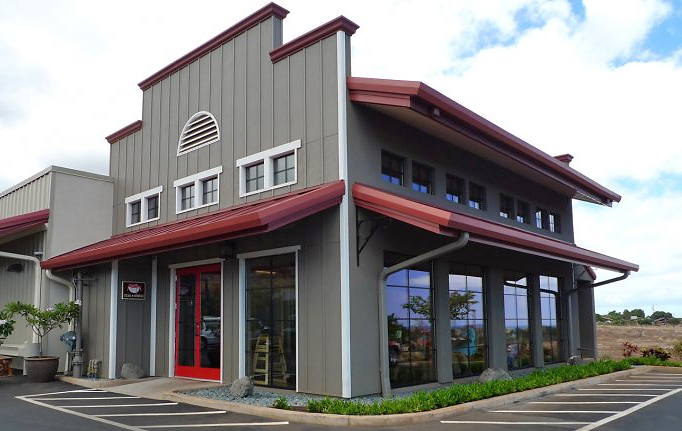 Sadly could not get a reservation at Koiso and the BBQ place Ronnie mentions upthread in Kihei just wasn’t open when we were in the area, bummed about missing those. We did have a terrific meal at Sansei in Kihei. 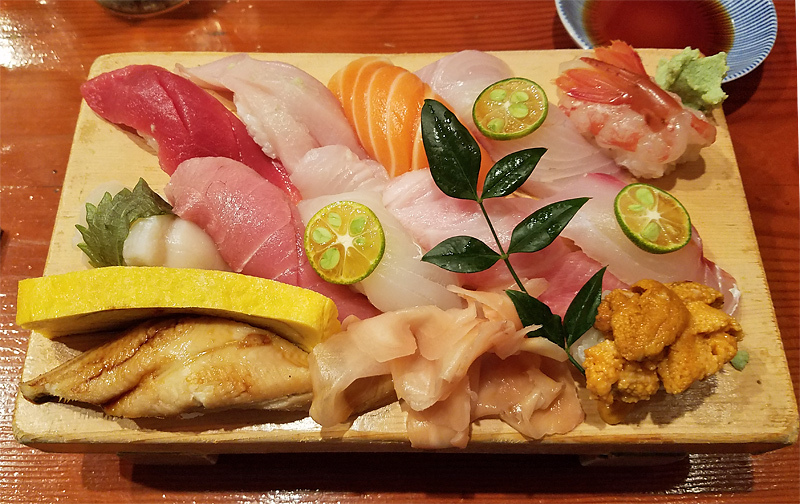 http://sanseihawaii.com/kihei/ The sashimi trio of local caught fish (snapper, tuna, Hamachi) was so fresh. 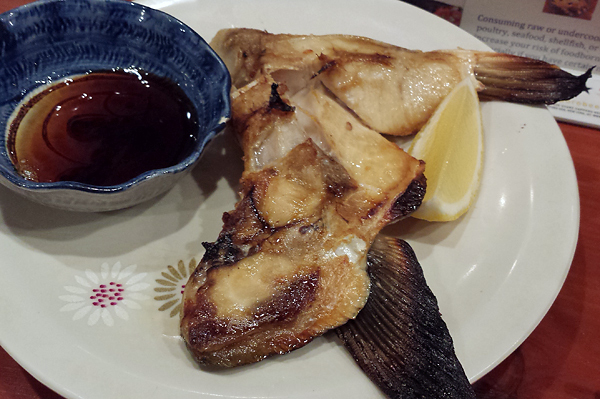 The grilled Hamachi collar took things to another level. I can get carried away using my hands sometime and sometimes I’ll get the “use your fork Mr born in a barn” look from Mrs Willie, there were none of those looks, only her urging me to dig out that piece, did you get that piece. We simply devoured this, amazing and what a great way to cap off our Maui holiday. Having been to Maui numerous times now, I've come to the conclusion that it's really not much of a food destination, which is totally fine. That's not why I go there. We manage to eat well enough but there are very few places on the Valley Island about which I can say "it's good" without also including the "for Maui" caveat in my description. You can spend some serious money there chasing some pretty average food. That said, Koiso continues to stand out as a true destination. It's our favorite place in Maui and during our most recent trip we ate there 3 times. On our last visit, we were a little nervous when we saw a 6-top seated ahead of us (at the sole table that typically seats 4). However, it led to a great moment during which we got to see a master at the top of his craft . . . Watching him systematically assemble these boards was spectacular. He obviously loves what he does and it showed in his every movement. Not only are the quality of the fish and rice exceptional but the hospitality is simply unparallelled. And the price is amazingly reasonable, especially for Maui, which makes it even more of a gem. If you want to go, it's best to book about a month ahead. It's by reservation only and you have to call. They do not seat walk-ins. No surprise, they're still crushing it at Koiso. 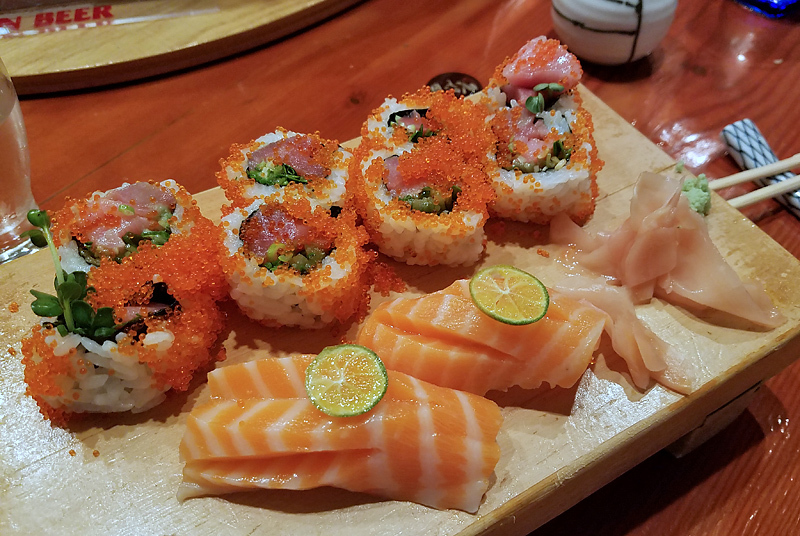 After a recent Omakase, we finished up with a couple of other items: Ankimo, Spicy Tuna Roll with Masago and King Salmon nigiri . . .
We actually found some other recommendable spots on our most recent trip, and not bank-breakers, either. More info on those to follow. 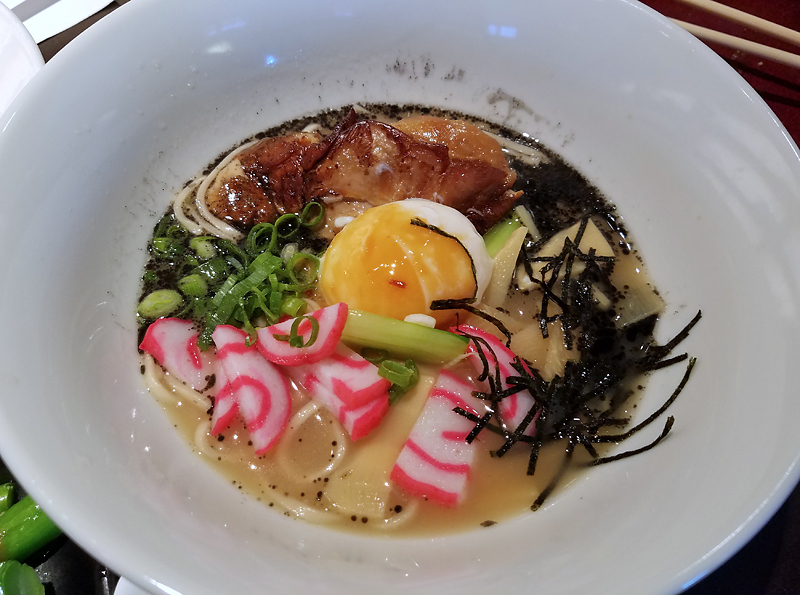 Hardly a secret but new to us was Star Noodle, a locally-focused, pan-Asian spot that's located in the Lahaina Business Park. Several locals recommended it to us, so we decided to have lunch there. 1 pm on a Saturday afternoon and there was a short wait for table seating, so we opted for two stools at the bar, which faces the kitchen pass. This was a good vantage point, as we could see and smell many of the dishes as they came out . . . 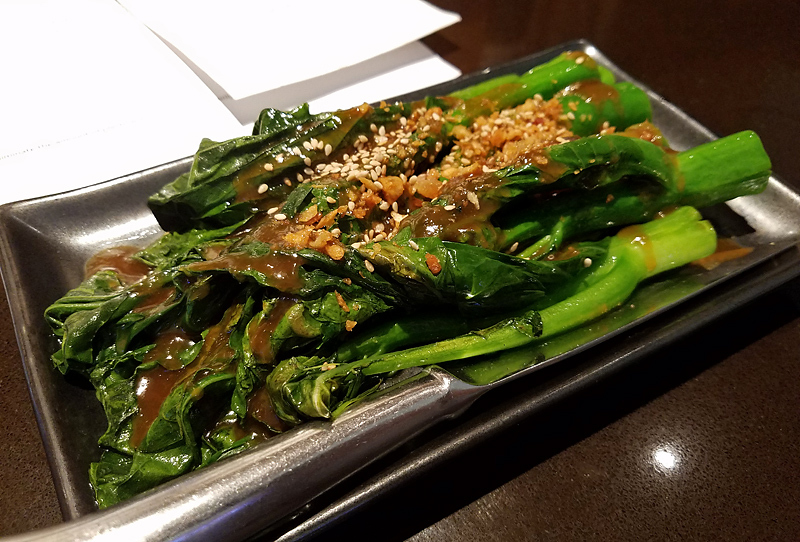 This had a gomae-type sauce, which balanced the bitterness of the broccoli very nicely. Just a big old plate of yum! This was actually half of a full portion, which the kitchen split into two for us. We didn't ask for that but I guess it's the default when two people are sharing a bowl. That's not a bad thought but I think because of it, the proportions here suffered a bit. Everything tasted great, especially the lip-smacking broth, but there just wasn't enough of it in either of the half bowls. 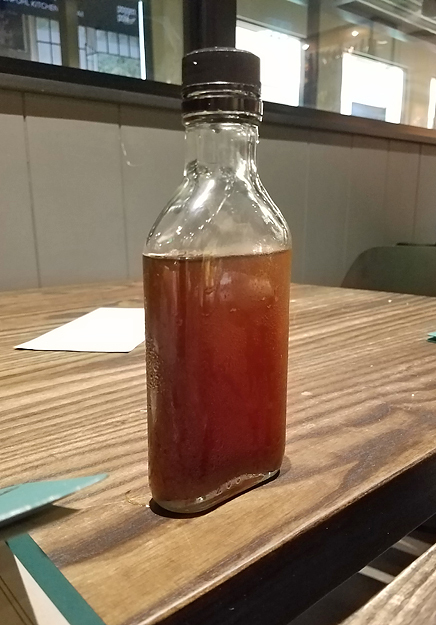 We asked our server what it was that was coming out of the kitchen with the unmistakable smell of fish sauce. This was it and I'm so glad we ordered it. I loved this dish, which showcased some perfectly unctuous chunks of pork belly, along with some grilled onions and a loose poached egg. It was still sizzling when it was placed in front of us. We were staying in Wailea, so it was nearly an hour drive to Star Noodle. Still, I'm sorry we didn't make it back for another visit. Hopefully, next time we can hit it more than once. 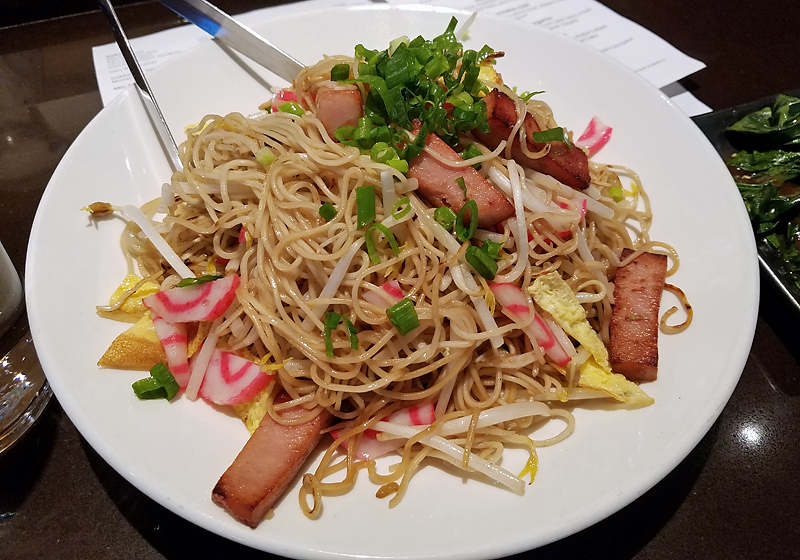 The chef who started Star Noodle, Sheldon Simeon, has moved on and currently has a couple of other notable places in Maui: Lineage (Wailea) and Tin Roof (Kahalui). More on those in a bit. ronnie_suburban wrote: Hardly a secret but new to us was Star Noodle, a locally-focused, pan-Asian spot that's located in the Lahaina Business Park. Several locals recommended it to us, so we decided to have lunch there. 1 pm on a Saturday afternoon and there was a short wait for table seating, so we opted for two stools at the bar, which faces the kitchen pass. This was a good vantage point, as we could see and smell many of the dishes as they came out . . . It's been two years, but we sat at the bar and also had a really nice dinner. We had a long wait sitting outside, but a flask helped pass the time while we chatted. 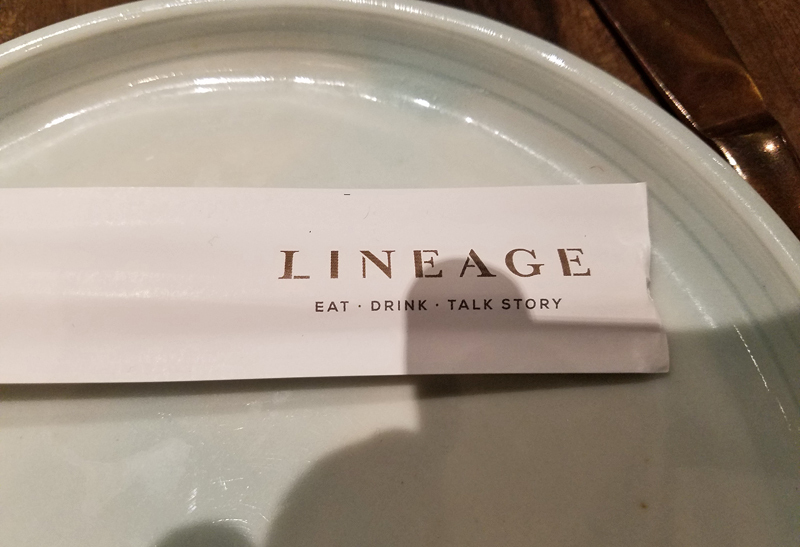 It's called Lineage and yes, it's in The Shops At Wailea, in its own building on the north end of the complex. We had a nice meal there and managed to get away pretty cheaply but the featured main courses -- cheffed-up takes on some iconic local dishes, intended for sharing -- range from $70-$75 each. For better or for worse, by the time we got to the point in our meal where we might have been ready to order one, we had already filled up on other items, most of which were excellent . . .
First, we ordered a few things from one of the carts that were being rolled around the restaurant . . .
A really nice assortment of local veggies, dressed perfectly. Sorry for the crappy picture. 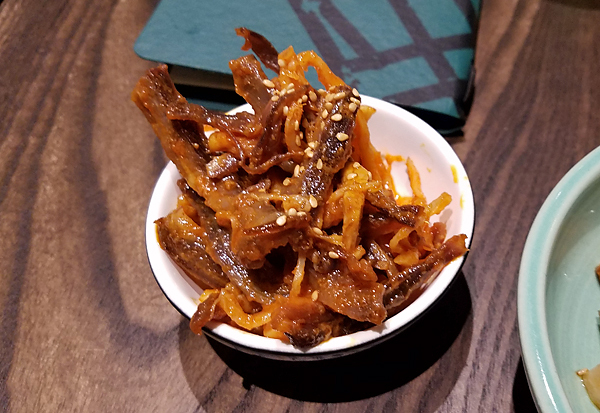 This funky, salty-sweet dried meat was sticky-licious. I really enjoyed the dip itself, which reminded me of a compound cream cheese I've had before at a few other places in Maui. Next up, some items from the menus . . . This was my favorite item (ordered a second one after I polished off the first one) and, I have to say, the best version of musubi I've ever enjoyed. 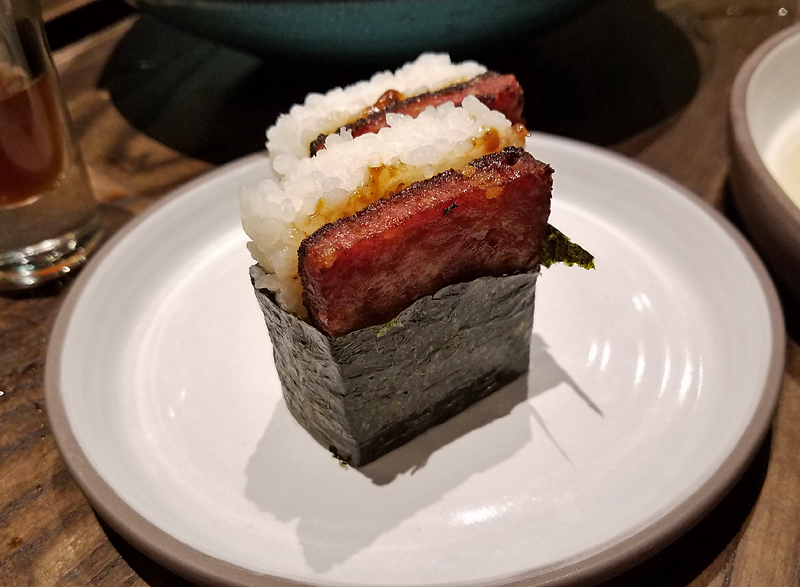 Aside from the delicious house-made spam, I think the reason I liked it so much was the ratio of rice to other ingredients, which was considerably lower than in most versions I remember having. This allowed the wonderful spam to really shine. The bite-through on the nori was dead solid perfect, too. Maybe the double-order here was the reason we were too full to order a main course! The rinds were just fine but I loved the signature chili pepper water. I managed to get this home, wrapped up in some clothes in my suitcase. You do shots? Perfectly fine. 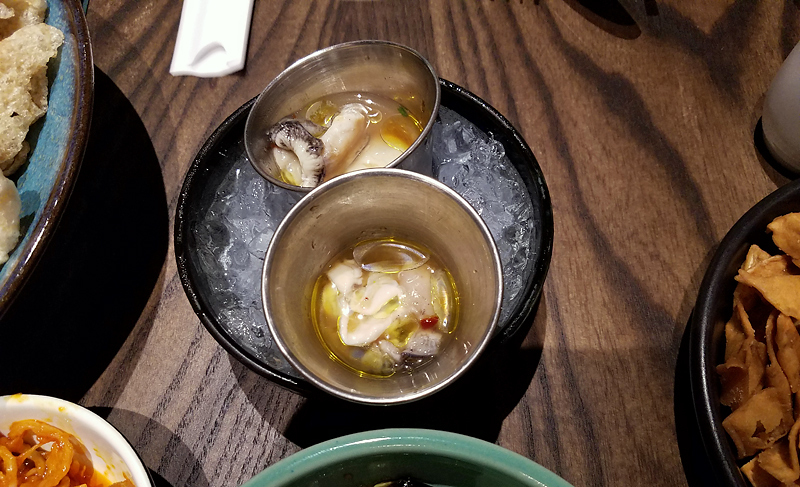 I wanted to try them because they are somewhat of a signature item for chef Simeon but I'm generally not a fan of any oyster that cannot be enjoyed on its own. Outstanding flavors and exceptionally moist, tender chicken. This reminded me of an analogous dish I've had at a few Szechuan places but this was just a much higher cut. If you look closely you can see some of the meat on the left side of the bowl under the greens. This was another great dish, with tender flavorful meat accompanied by some really nice fresh vegetables. I'd love to try one of the large share entrees but on this visit, we were more interested in sampling a variety of items on the menu. With just two of us in the party, it was one or the other. That said, I wonder if a whole Huli Huli chicken can ever be worth it at $75. Is it really something special? Or is it just a tourist-targeted sucker play intended to entice all the folks who are too timid to venture beyond the confines of Wailea? 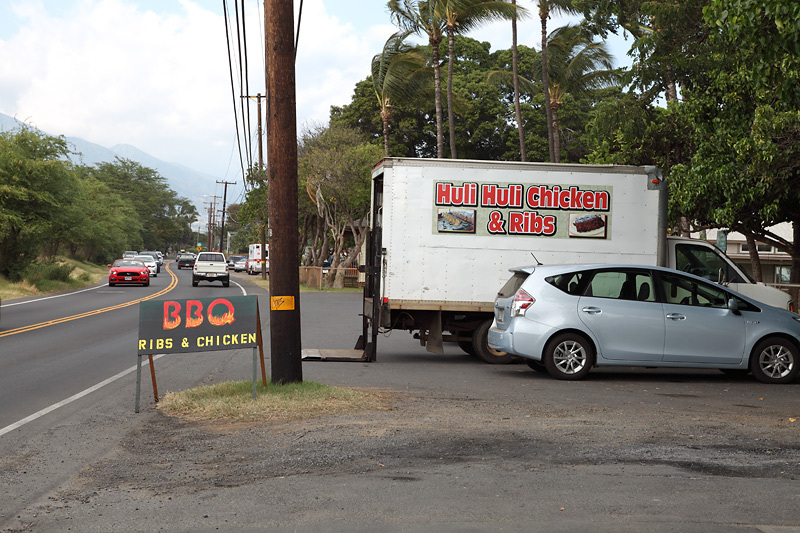 If you stop at the Keolahou Congregational Hawaiian Church in Kihei on Wednesdays or Saturdays, you can buy 4 huli huli chickens for roughly the same price. In any case, this meal ended up being pretty affordable by Wailea standards: all this and a couple of drinks for $128 before tip. I'd definitely go back. For mostly sentimental reasons, no trip to Maui would be complete without a stop at the Kihei Caffe. The food is perfectly fine but it's more about immersing ourselves in the vibe as early in the trip as possible. So, for us, the visit traditionally takes place on the first morning of the trip . . . I gotta say, they really nailed the fish. Ok, whoops on the over-easy but this was still a mighty tasty plate. We got tipped off about Fish Market Maui in Lahaina by a friend of a friend and it turned out to be excellent. We got there at about 1 pm on a Wednesday and it was bustling. As the name indicates, it is a fish market and eatery. There are a few counter seats inside and, as you can see, a couple of tables outside. So, it's not exactly a relaxing atmosphere but the quality of the food more than made up for it . . . I'm gonna lead off with the weakest item (and yes, I was the genius who ordered pork at the fish market). 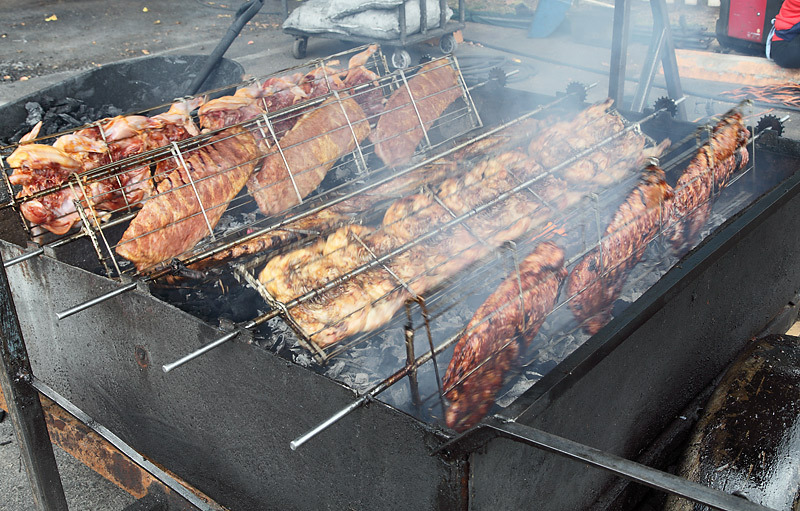 The pork was flavorful and crispy but also a little on the dry side. Still, not bad at all. I love this type of fish taco but they're pretty hard to find in Maui. Not surprisingly, most fish taco preparations there involve grilled fish and fruit-based salsa. I get it but that's just not my thing. So, I was delighted to have found these; an excellent rendition of the style. The batter was light and crispy. 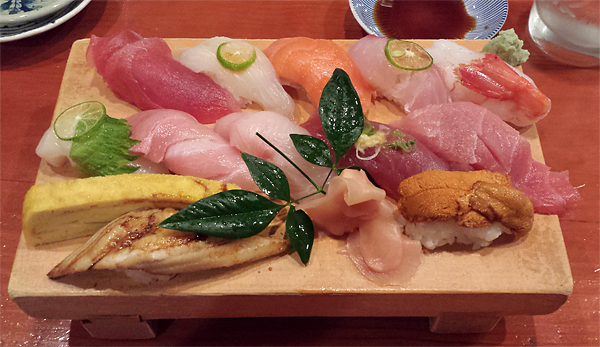 The fish was tender and moist and the toppings were outstanding. This alone would have me returning on a regular basis if I were a local. Ok, so not exactly recognizable as seared but still, a really tasty piece of piece . . . and better to be under-seared than over. Its freshness was readily apparent. I'm not a huge fan of macaroni salad but this was, with virtually no discernible sweetness, was the best one I tried on this trip. The cubes of fresh ahi, sliced onions, etc. sit in a hotel pan in the refrigerator case and the poke is dressed only after it's ordered -- before it's packaged and served (it's tossed in a large bowl). This prevents over-marination and keeps the fish in perfect shape right up until it's ready to be eaten. This is definitely one of the better versions I've ever had in Maui. After I snarfed this down, I was tempted to get some more but the line had grown too long by then, so it was time to move on. Fyi, the poke is sold on the market side of the place, not the eatery side, so it has its own dedicated line and was busy throughout our visit. So too was the eatery side but it didn't seem quite as busy.